Apricots are all the more precious for having such a short season. Which might explain my impulsive decision to buy apricots for jam making shortly before Christmas. Even so, I don't know what sort of insanity propelled me to make jam on Christmas Eve. Yet I am glad of it. Being able to enjoy a piece of home made bread with home made jam is one of life's little pleasures. I didn't have quite as many apricots as I wanted so I added some nectarines. Being Christmas Eve, I thought maybe I could give this away as gifts. So I added some vanilla to make it a bit more fancy. I have enough jam making experience for the process to be fairly straightforward. My main problem was that it took a long time to thicken up. Reading about jam making since then, I have wondered if adding the sugar later might have helped or perhaps it was because I use less sugar than most recipes recommend. I have also read that ripe fruit has better pectin for setting than overripe fruit so maybe my fruit was too mushy. I think it might have taken almost 2 hours which seems crazy on Christmas Eve. 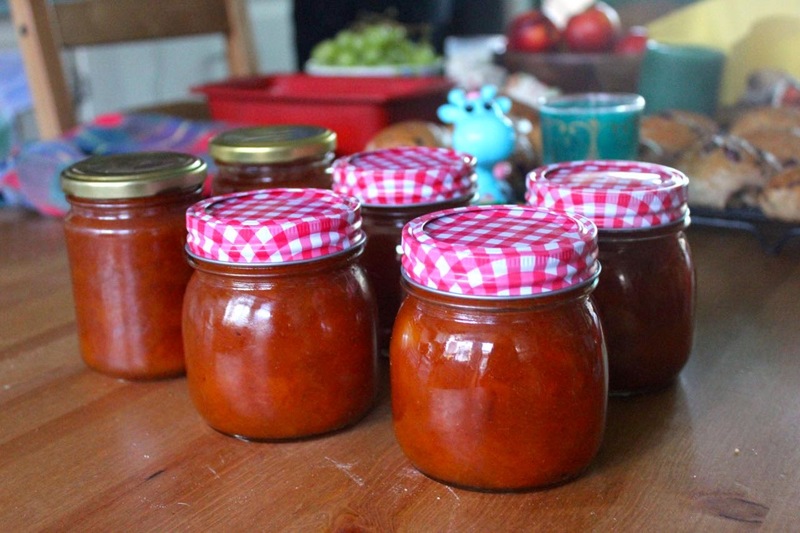 At 7pm I was ladling the jam into jars and quite relieved to have them done. 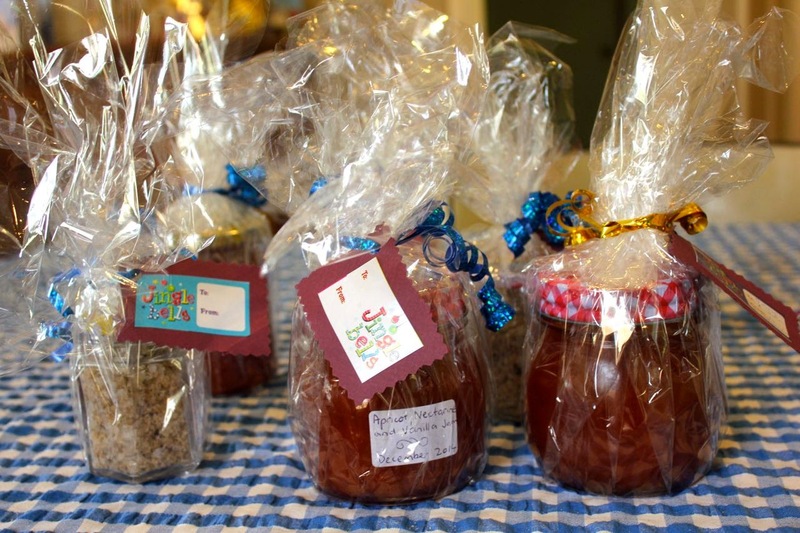 Later that evening while watching Carols by Candlelight on the telly I gift-wrapped and labeled the jams. However I wasn't terribly organised and hadn't thought through who I was giving presents to and most of those who might have appreciated it were people I had already seen. Perhaps subconsciously this was my way of leaving more for me! Christmas Eve seems so far away, as does the heyday of apricot season when I was buying oodles of juicy apricots and my brother was gifting me a bag of them from his tree. 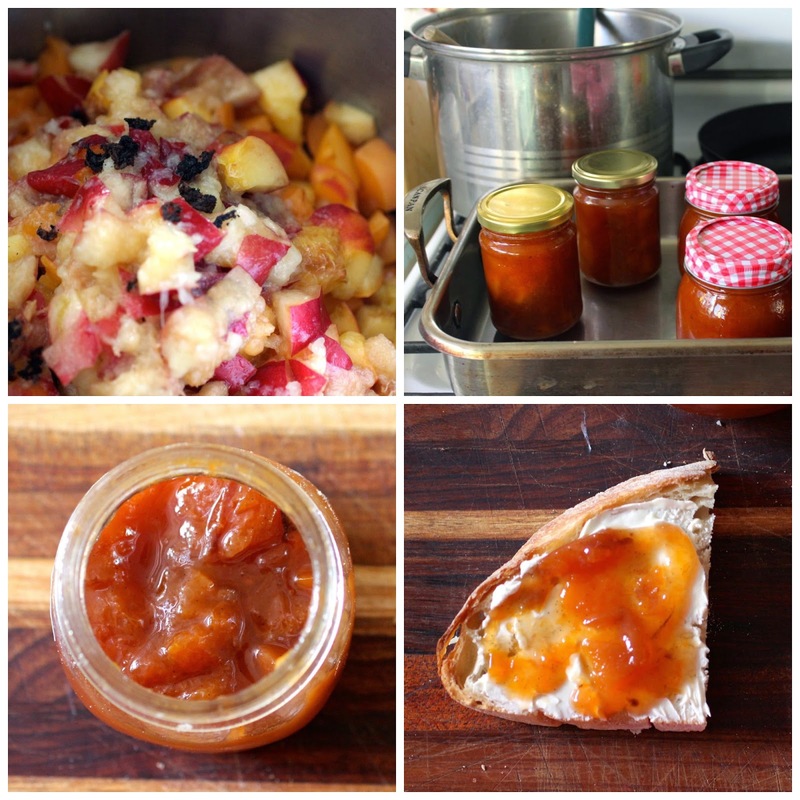 However that is the joy of preserving fruit. 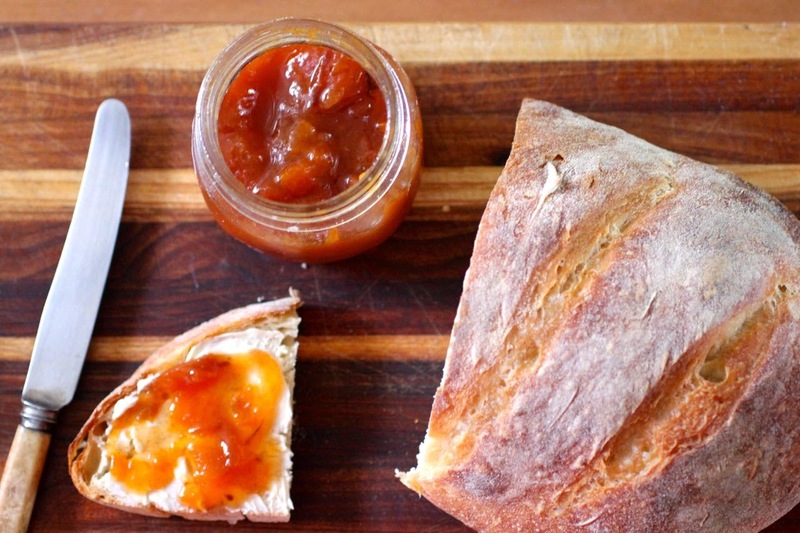 When I opened my first jar of this jam, it tasted like memories of sweet juicy apricots. None of that ridiculously sweet jam from the supermarket. I add less sugar to my jam so I can taste the fruit better. 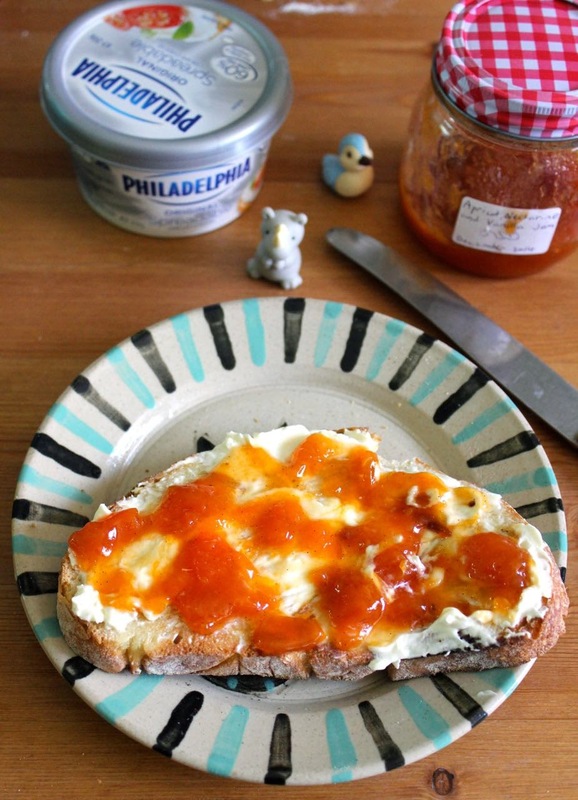 I am very partial to apricot jam and cream cheese on sourdough bread. A friend introduced me to the combination on a visit to Washington DC many years ago and I often think of her when I eat it. I have thought about baking cakes or slices with the jam but it is so good that I just want to eat it on toast. Stone and dice fruit. Mix with remaining ingredients and gently simmer until fruit drops off the spoon in rather than runs off as a liquid (or when you place a spoonful on a chilled saucer you can run your finger through and leave a clean line rather than jam pooling back). It took me about 1 1/2 to 2 hours. Bottle jam using this method or your own way (such as the dishwasher). Keeps about 6 months to 12 months. Everyone deserves a second chance. I had one on Shrove Tuesday this year. You see, on my birthday I went to the Pancake Parlour to indulge in chocolate pancakes but was disappointed. It was too much ice cream and not enough pancake. So I made them myself and they were perfect. 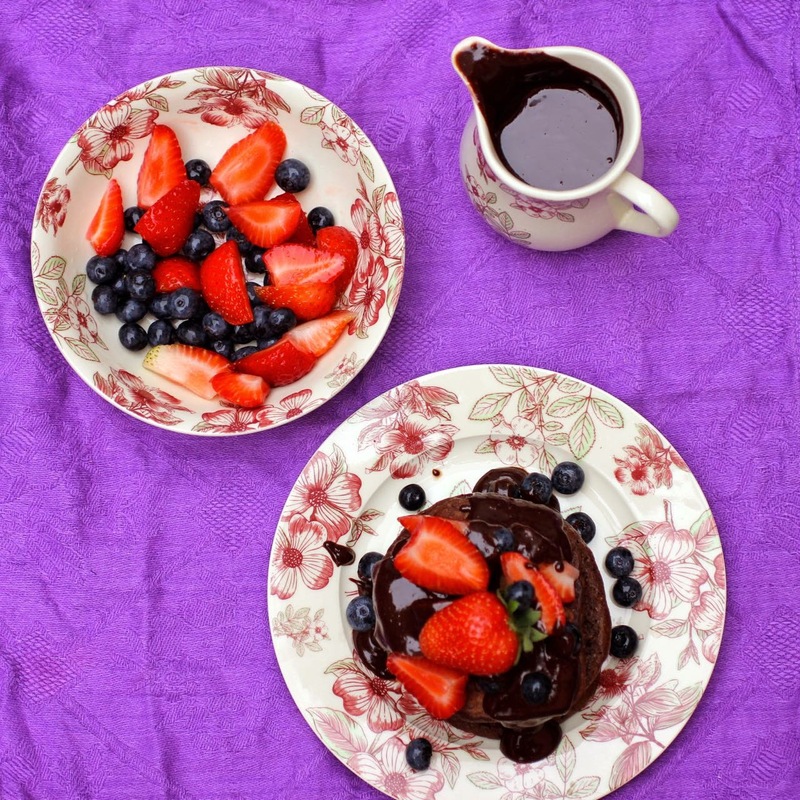 Give me chocolate sauce and berries rather than ice cream any day! 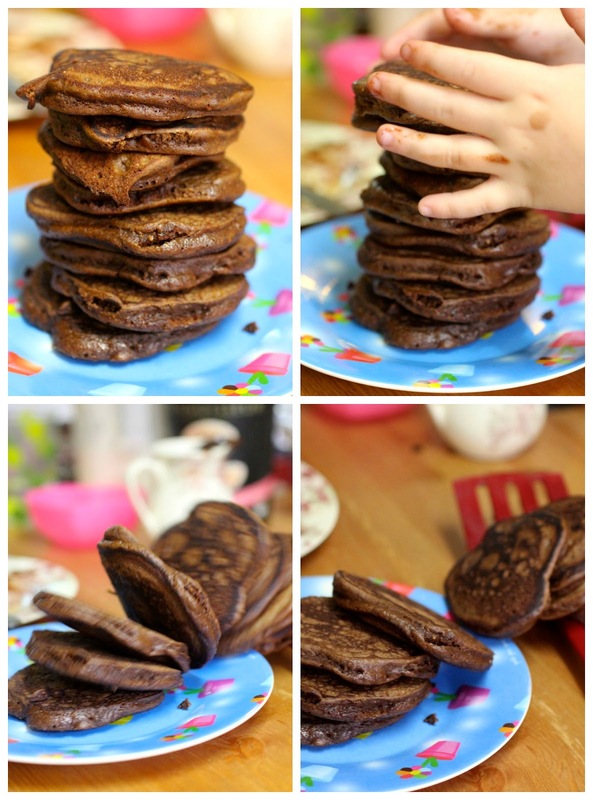 The chocolate pancake recipe was found through Jac's 25 pancake stacks to drool over. They were too decadent for breakfast so we had them for dessert. After a simple soup for dinner. The first pancake I made was a bit one but after that I made them smaller like my usual ones. Even with crowding a few on the pan I found that this mixture made a lot of pancakes. We still have quite a few of them in the freezer. The chocolate sauce was a revelation. Last year I found an idea on Fat Free Vegan for chocolate ganache using choc chips, milk and nut butter rather than chocolate and cream. I used this for the sauce and it worked brilliantly. This uses ingredients we usually have about rather than having to buy cream. The pancakes tasted so good I wanted to take some photos to do them justice. They were dark and decadent in flavour, yet light and fluffy with texture. 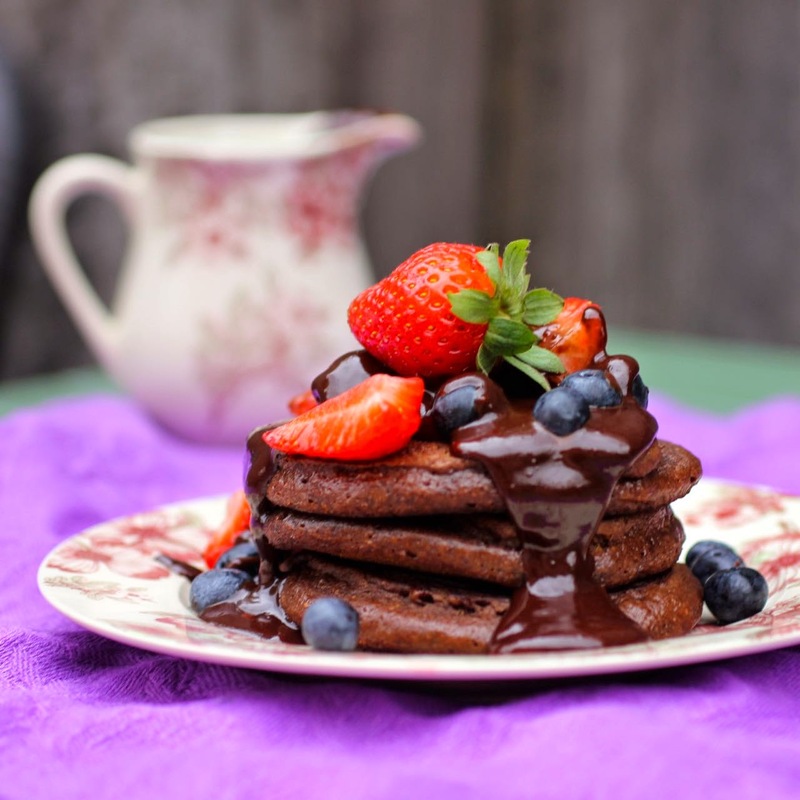 The rich fudgy chocolate sauce worked perfectly with the juicy berries and pillowy pancakes. E and Sylvia had some ice cream with theirs but I thought they were crazy! It was a gloomy grey day. By the time we had made the pancakes after dinner, the light was dull inside. I took the pancakes outside where I found it was drizzling. I then discovered that my camera memory card was full and while I was trying to clear it our cat started taking an interest in the pancakes! We had so many pancakes that we were able to have a go at stacking them. I am always amazed at photos of huge stacks of pancakes. Do people ever eat that many? And how do they stay in a neat stack. I took some photos of Sylvia trying to stack them and you can see it was not easy. Seriously if I really wanted to do it properly I would make bigger pancakes and stack them without a 5 year old about. It was a fitting end to the evening when I read to Sylvia before bedtime and the book was about the Moomins eating pancakes. We have recently finished the Finn Family Moomintroll. It has awakened me to the charm of the Moomins. I really loved it when the Hobgoblin visited and was given some pancakes. He hadn't eaten pancakes for 85 years. Yet I think he should eat them more often because the Moomins felt that "one can't be too dangerous, if they like to eat pancakes. I heartily agree! 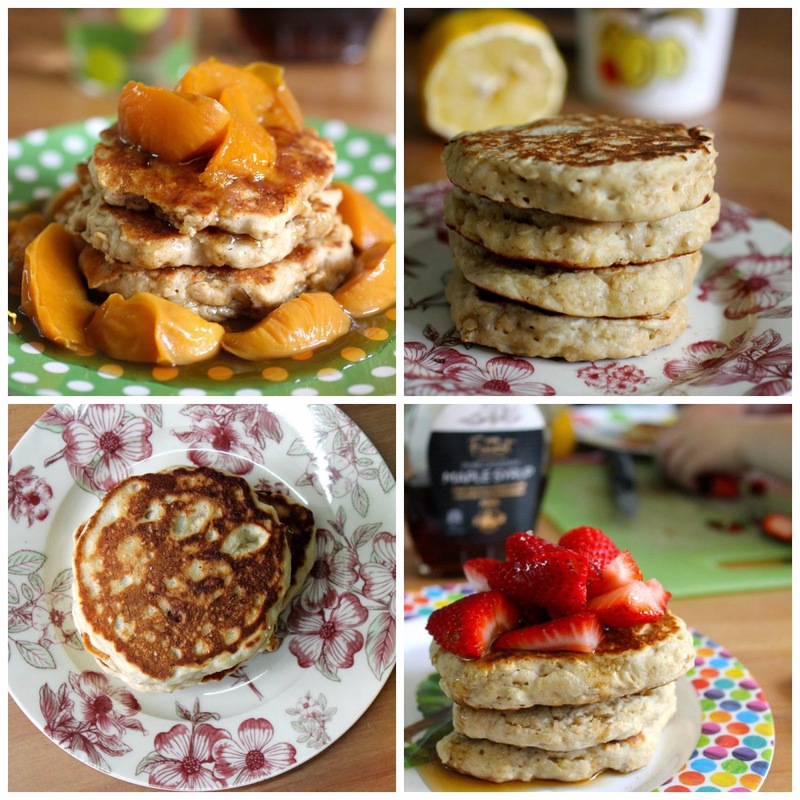 I am sending these pancakes to Bangers and; Mash and Eat Your Veg for February's Healthy Family Foodies blog event with the theme of Pancake Party, and to Jac at Tinned Tomatoes for Bookmarked Recipes. Mix milk and vinegar and set aside to sour. Mix dry ingredients in a large bowl. Use a fork to lightly whisk soured milk, eggs, oil and maple syrup. Pour wet ingredients into dry ingredients and mix until just combined. Heat a large non stick heavy bottomed frypan over medium heat. Rub a little butter, margarine or oil over the surface (I use the back of a teaspoon to spread margarine about). Drop heaped dessertspoons of mixture onto pan with a little space between them. Cook for 1 to 2 minutes - a few bubbles should appear - flip and cook another minute or so until lightly browned on each side. Microwave on 30 seconds or until choc chips are just about melted and stir well until smooth and glossy. 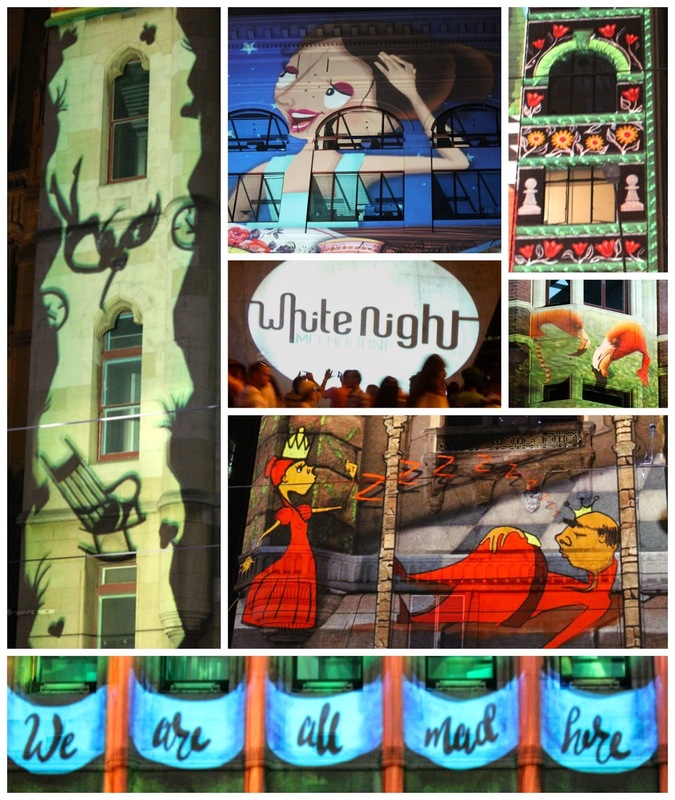 What is not to love about White Night! 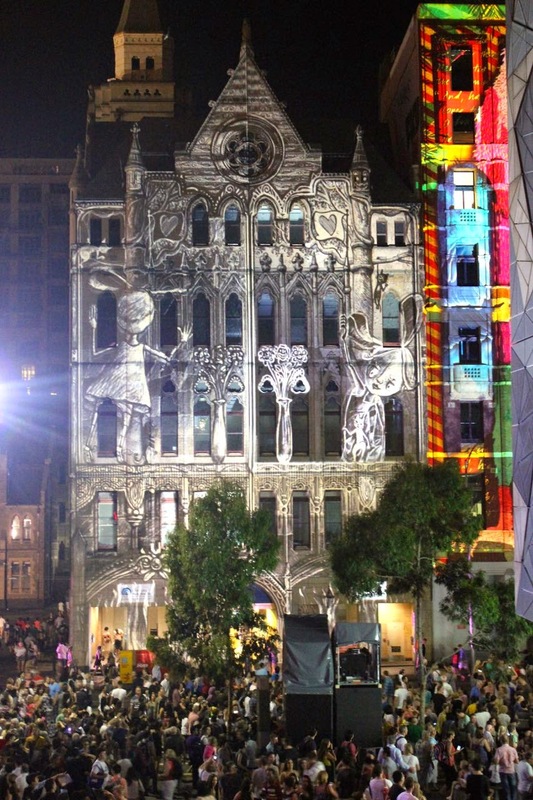 The spotlight is on Melbourne's magnificent buildings and it is a fun colourful spotlight. The streets are closed to all traffic and open to pedestrians. Fortunately after the thunderstorms, the weather cleared and was a pleasant balmy 31 C. I was really glad to be one of the crowds to enjoy the beauty in a relaxed atmosphere. 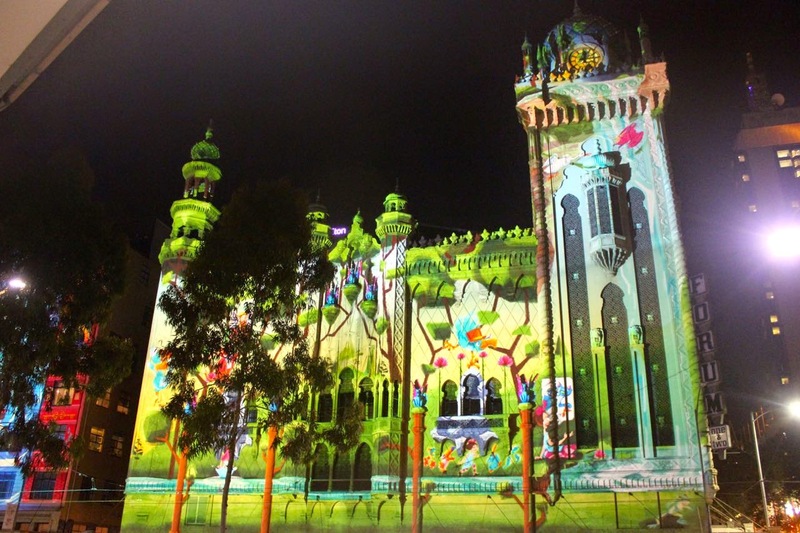 A short walk up Flinders Street found me amazed at the projections with the theme of Alice in Wonderland (to celebrate the 150th anniversary of the book). I once studied the book as an undergraduate and love its dreamy weirdness. 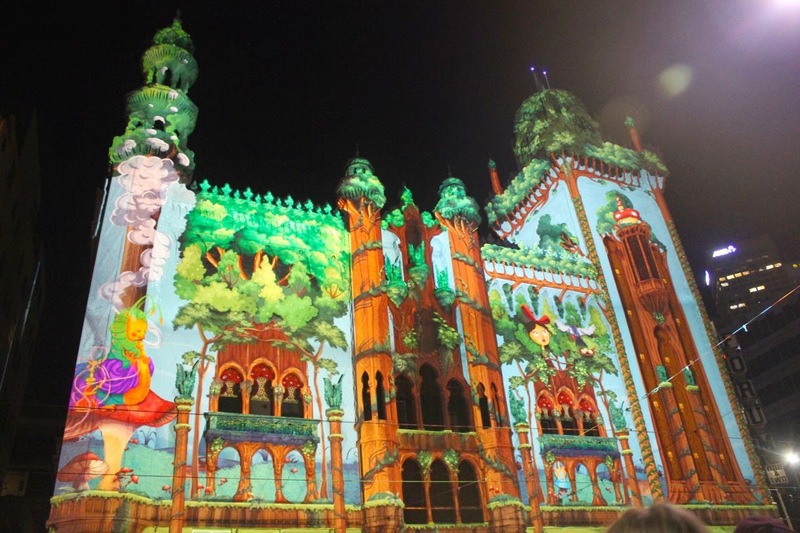 It didn't take long to see that the projections changed regularly. Which meant that the crowd stayed to watch and moved slowly rather than rushing by. 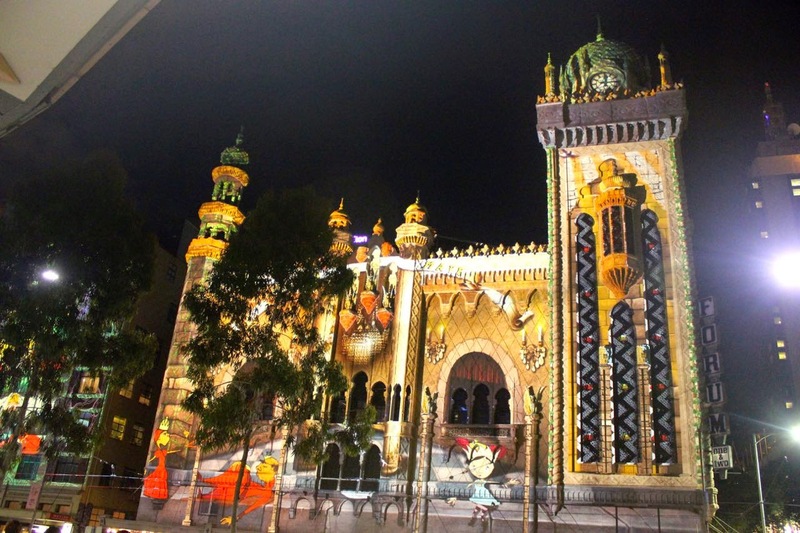 I particularly loved the projections on the moorish style Forum Theatre, an amazing old building with griffins, keyhole windows, domes, and cupolas. The features were all built into the design. I stayed about the Forum for a while, marvelling at the projections. 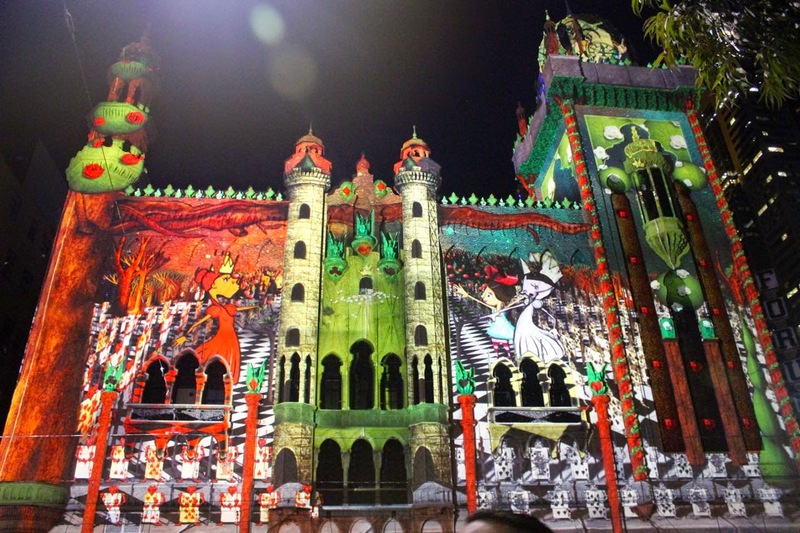 It was fun to just watch the crowd's reactions to the lights, especially the anticipation when the lights dimmed before a new projection. Spending time waiting for new projections, also gave me time to look at the details. I could have stayed watching for hours but my time was limited so I also spent time walking along the other buildings in the row. 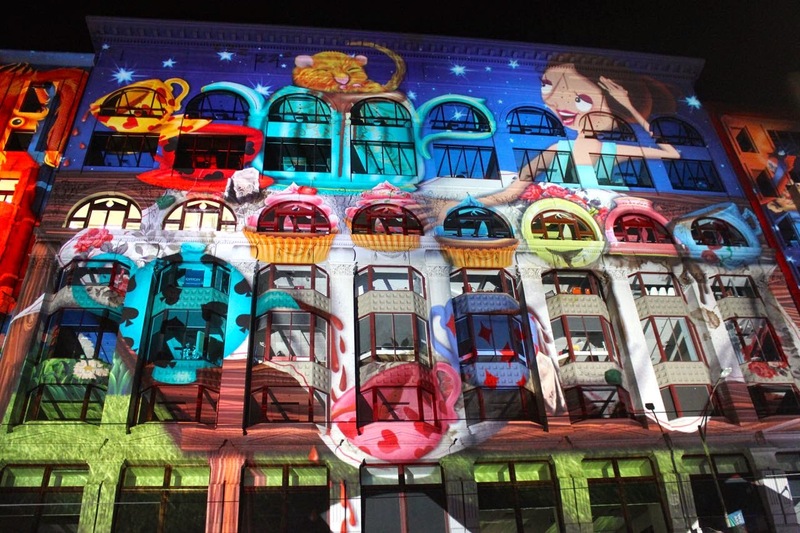 One of my favourite other projections was the black and white projection below. Walking up the steps to Federation Square gave a great view of the building and the crowd. 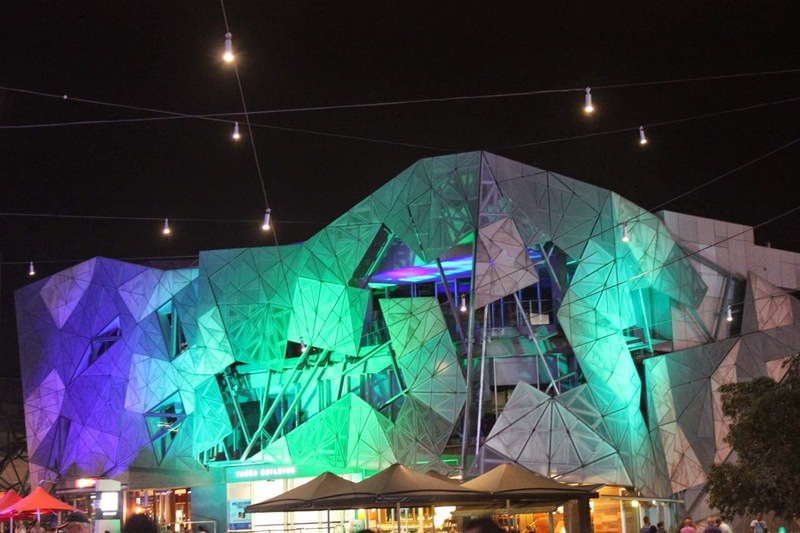 Federation Square was lit up with coloured lights and was heaving with crowds. I overheard someone remark at the crowds without any cost. 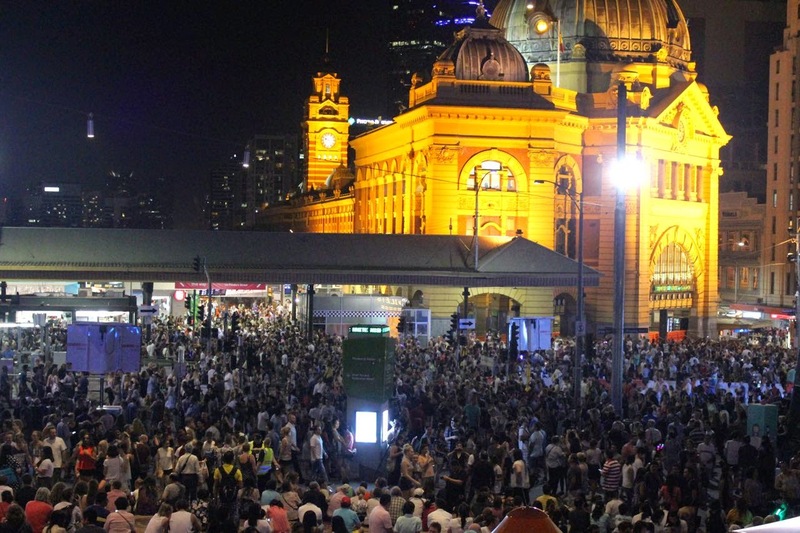 Yet all the bars and cafes around the river and Federation Square were doing a roaring trade. There were also lots of food trucks about. I didn't stay long enough to stop for food. My time was limited as I had a busy day on Sunday and couldn't stay out late. 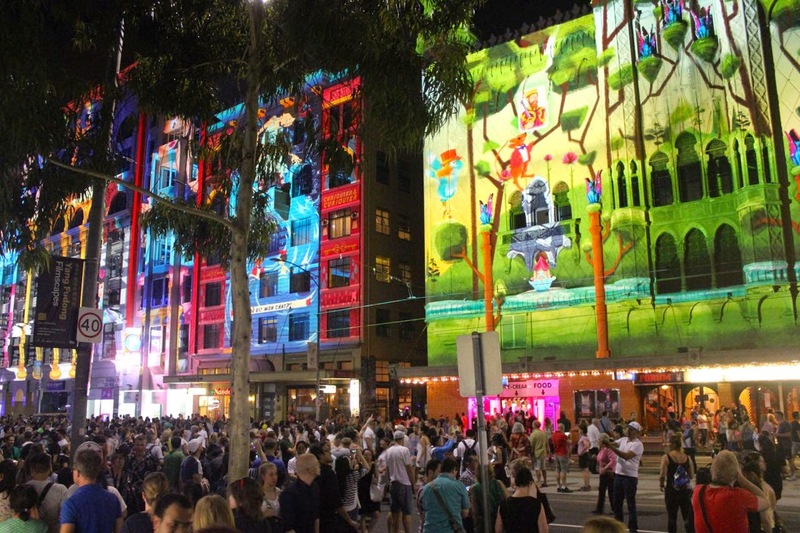 I walked along Swanston Street towards the National Gallery Victoria on St Kilda Rd. It would have been great to go inside if I had the time but instead I watched the Key Frames light show on the moat. Lots of structures made of industrial-style metal pieces were placed in the moat. 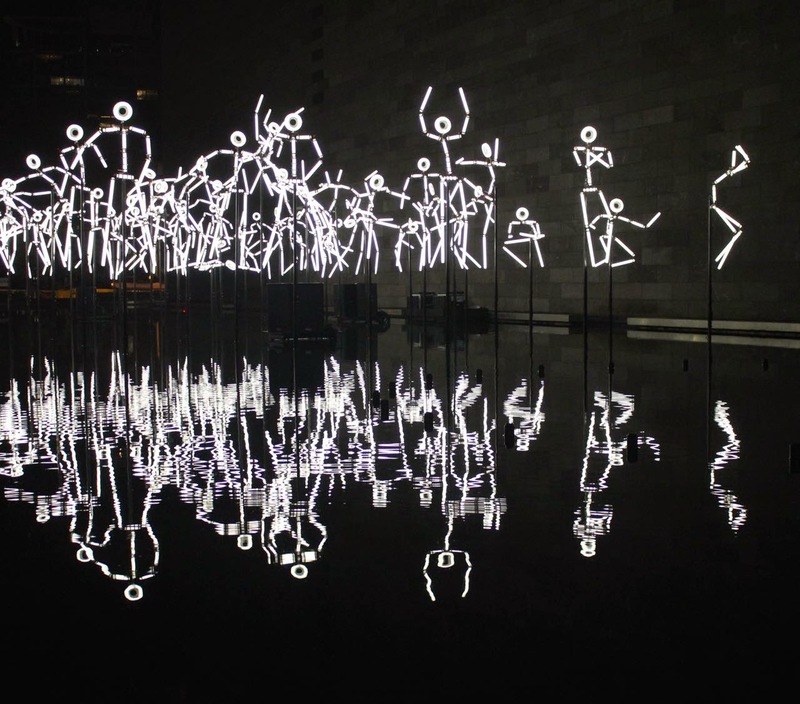 Light projected on to them made the figures look like they were racing or running or moving about. 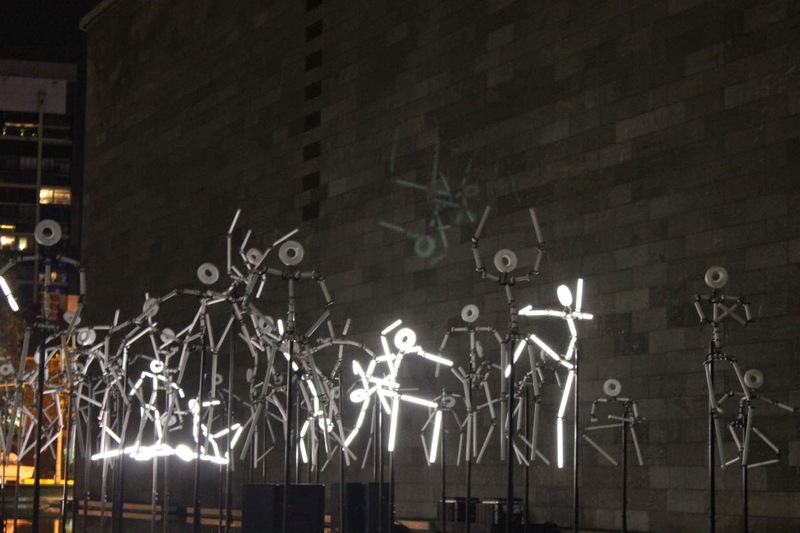 Finally they were all it up together into a crowd of figures. Then it was time to head back to the station for my train home. It was a great experience. Maybe next year I will have time to see more. I am delighted to have the opportunity to sing the praises of Ricki Heller's new book, Living Candida-Free. However I have so much I would love to say about it, that I must show restraint. 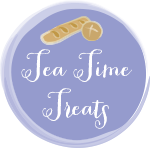 I discovered Ricki Heller's blog (then known as Diet, Dessert and Dogs) in late 2007, when we were both newbie bloggers. We have been friends ever since. I was also lucky enough to be one of the testers for the latest book. Having long being a fan, it was no surprise that I loved the recipes and can enthusiastically recommend the book to you. I even have permission to share one of a recipes for Asian Napa Cabbage Salad from the book below. Ricki is a generous and interesting blogger. Her writing is always entertaining and her recipes are innovative. In 2013, I posted an interview with Ricki when her previous book, Naturally Sweet and and Gluten Free was released. It was great fun to talk with Ricki. Though I loved her sweet recipes I expressed a hope she would produce a cookbook with her savoury recipes. And she did. 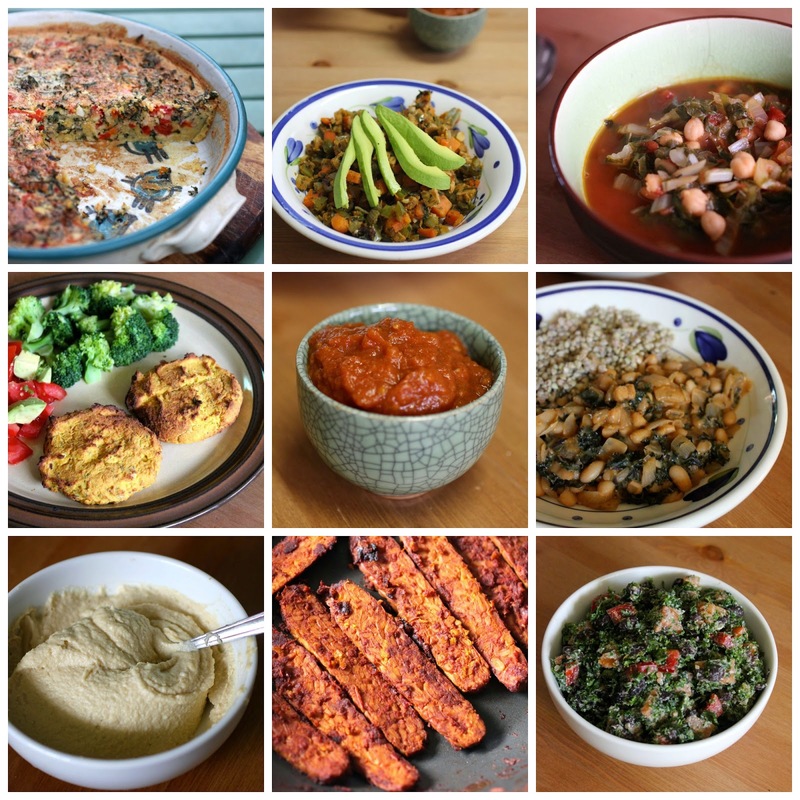 Living Candida-Free had 100 recipes and about two thirds of these are savoury. 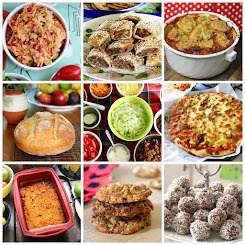 I was amazed when I sat down to write about it and found I had made almost half of these recipes. Many of these were made when recipe testing, a few I made from Ricki's blog, and I made more when I got my copy of the cookbook. 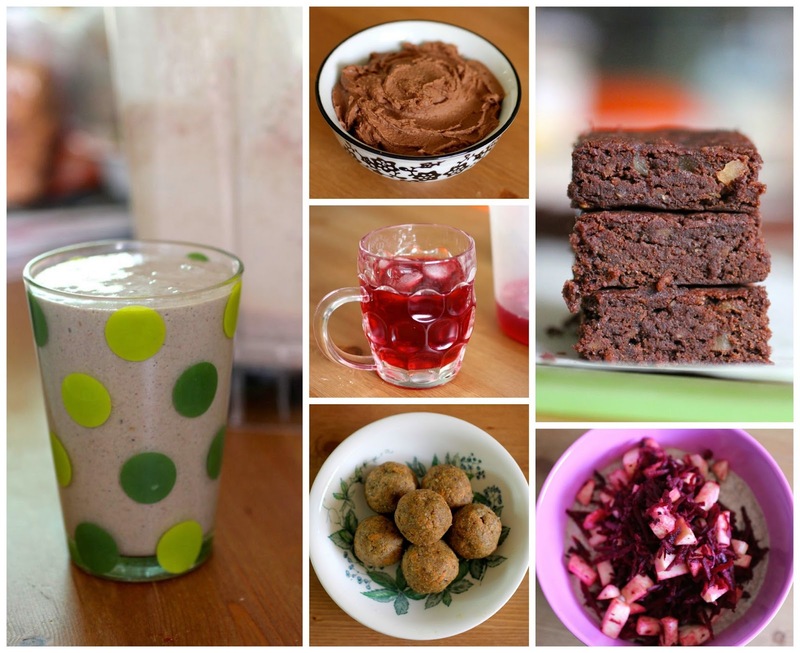 Grain free fudgy brownies, Raw apple porridge bowl. However it was really useful to try different ingredients and learn some of Ricki's techniques, rather than sticking with my usual habits. I also really enjoyed the interactive natures of sharing notes with the other testers and Ricki through a private blog. Recipe testing gave me great incentive for trying lots of Ricki's recipes. Some of these were dishes I had read about but never tried and others were a bit more complex ones that I hadn't got motivated to make. A lot of the photos in this post were taking during testing. They are all recipes I would happily make again. 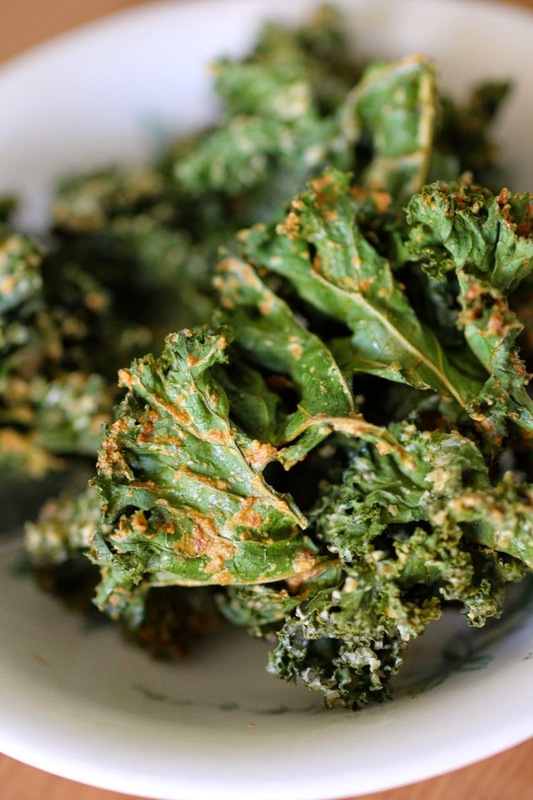 I made the best kale chips I have ever had, discovered how to scramble chickpea flour, made delicious creamy soups, and vibrant satisfying salads. I should pause to note that Living Candida-Free is targeted at people who are dealing with Candida. The book has a substantial introduction giving useful information about candida and strategies for dealing with it, particularly through diet. There is some good general information about digestion and how to develop healthy eating habits. 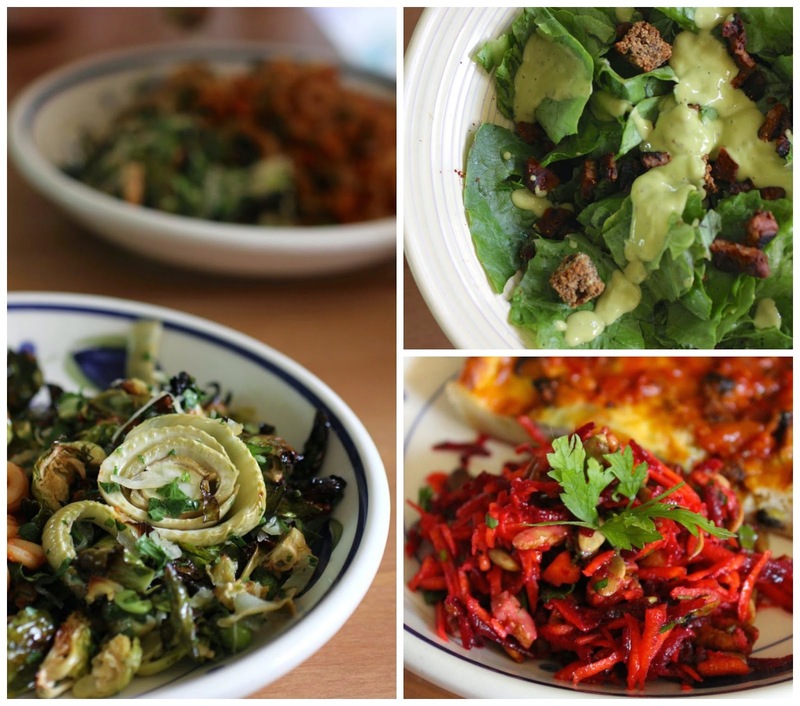 Ricki has suffered from candida and she shares the gluten free, low sugar and vegan recipes she created to return to good health, while eating well at the same time. When I told people about that I was testing recipes that were gluten free, low sugar and vegan, they would inevitably ask what I was making. If anyone can make this sort of diet look good, Ricki can. I ate so well while I was recipe testing. The food tasted amazing and I felt really healthy. And just check out the gorgeous pictures in the cookbook if you aren't convinced by my photos. Some stand out dishes included a vegan Eggplant Parmesan (known as an eggplant parma in Australia) and a Sunday Night Roast that were so impressive and substantial. These dishes were a lot of work but worth every moment. Many dishes, however, delivered a lot of complex flavours from surprisingly little effort such as the Spicy Beans with Chickpea Flatbreads and Creamy Greens with Asian Seasonings. My diet is not anti Candida, nor gluten free, nor low sugar, nor vegan. Yet I really love Ricki's recipes because they taste so good. I would highly recommend them to anyone who wants to eat exciting and healthy food. For those who eat anti candida, gluten free, low sugar or vegan, there is the added bonus of many made-from-scratch recipes such as Basic Nut or Seed Butter, Sauerkraut and Homemade Ketchup. 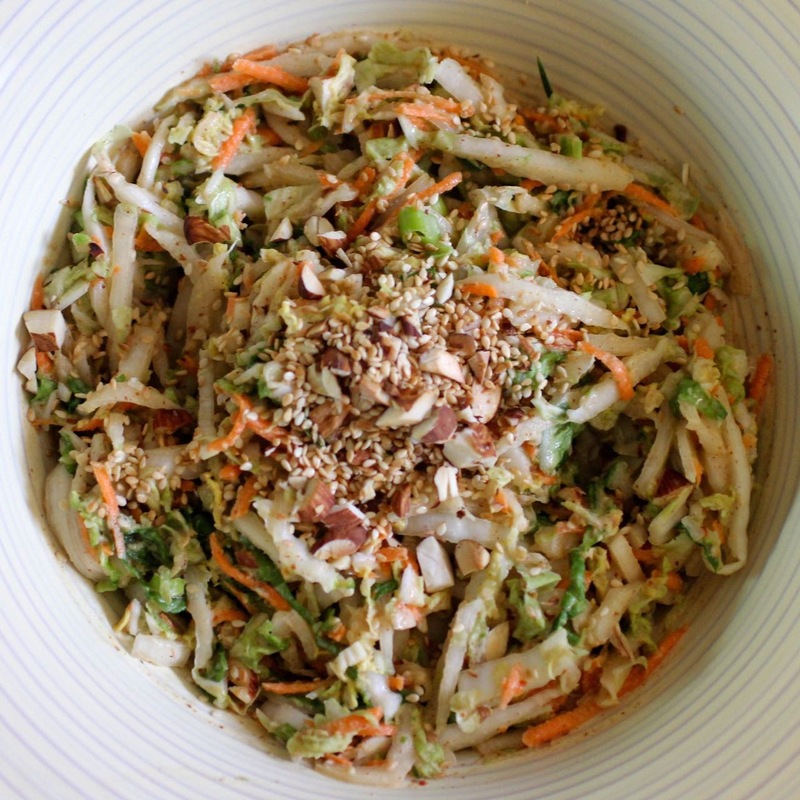 Today I am pleased to have permission from the publishers to share a recipe for a fantastic Asian Napa Cabbage Salad. 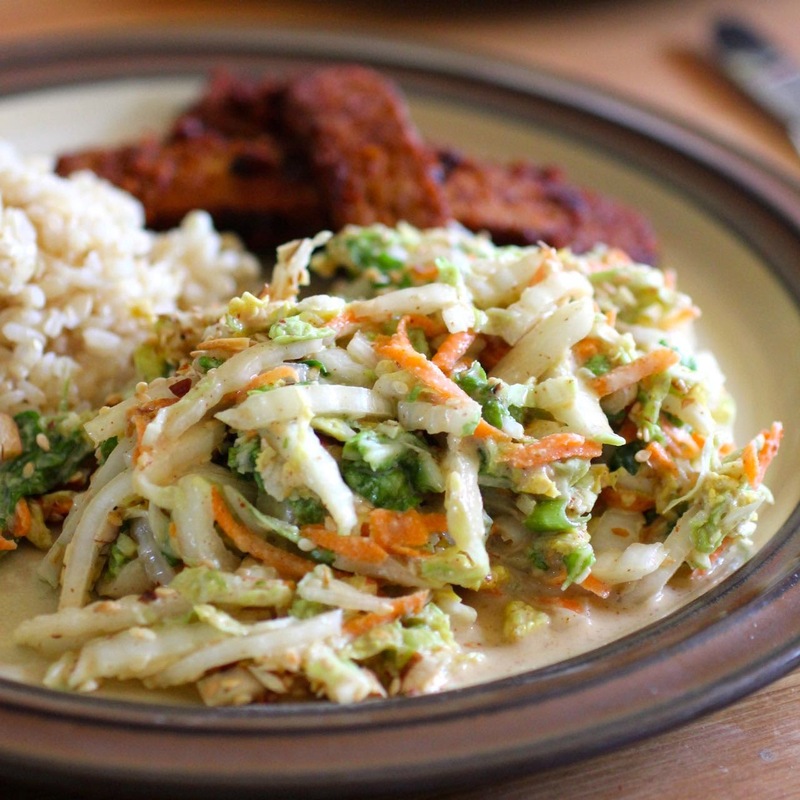 Ricki makes lots of silky smooth creamy sauces with nut butters and/or coconut milk. This is one of them. As well as using cabbage and carrot, she adds toasted nuts and seeds which give lots of wonderful texture and crunch. The salad was fairly quick to put together and tasted great. I served it with Glazed Tempeh from the cookbook and boiled brown rice. 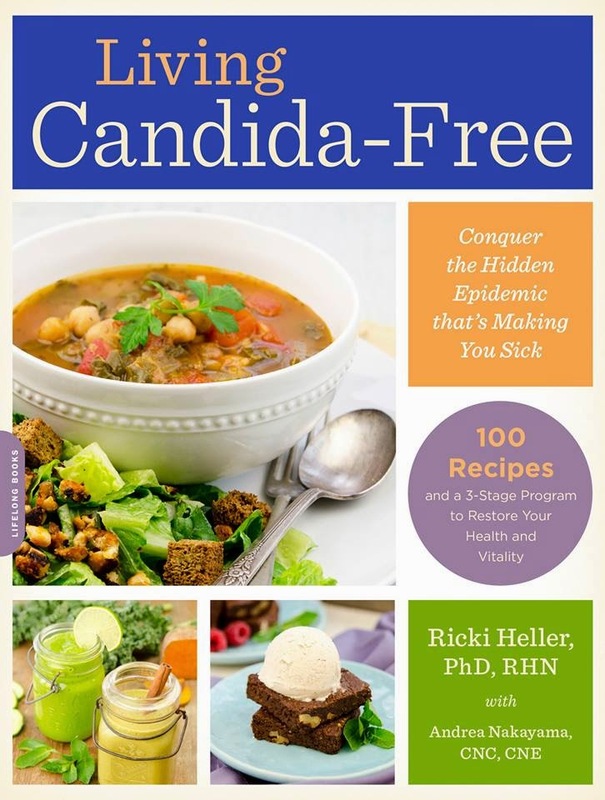 To find out more about Living Candida-Free, including a select list of recipes and links to other reviews of the book, visit the book page on Ricki's blog. You can also find links to buy the book there so that you too can cook yourself some magnificent food. From Living Candida-Free by Ricki Heller. Reprinted with permission from Da Capo Lifelong, © 2015. 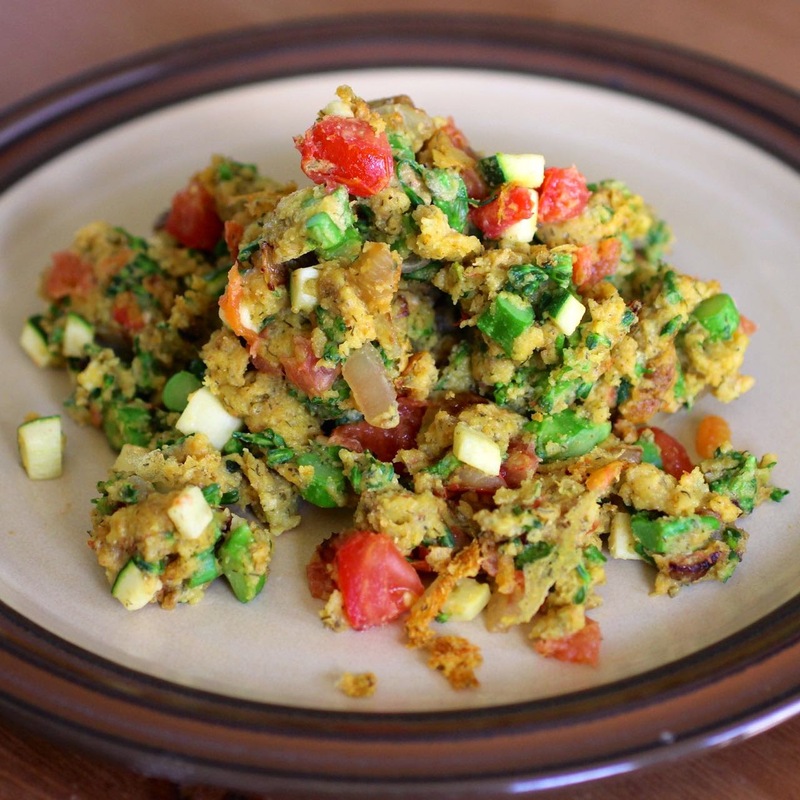 Make the dressing: Blend all the ingredients together in a small bowl. Make the salad: Place all the salad ingredients, except the sesame seeds, in a bowl and toss with the dressing. Sprinkle with the sesame seeds and serve. I had a huge Napa Cabbage and so I only used half of it. My nut butter was made from roasted almonds. I substituted about 1 1/2 to 2 tbsp maple syrup for the stevia (I made a note of this somewhere but can't find my notes so this is approximate.) I substituted chilli paste for red pepper flakes. I also toasted the almonds and sesame seeds. Disclaimer: I was sent a complimentary copy of Living Candida Free. I was not required to write a positive review of the book. All my opinions are my own. It is Shrove Tuesday and I am hoping to be eating pancakes tonight. Meanwhile I am sharing our favourite pancake recipe. I wish I could share more recipes that I make as much as this one. 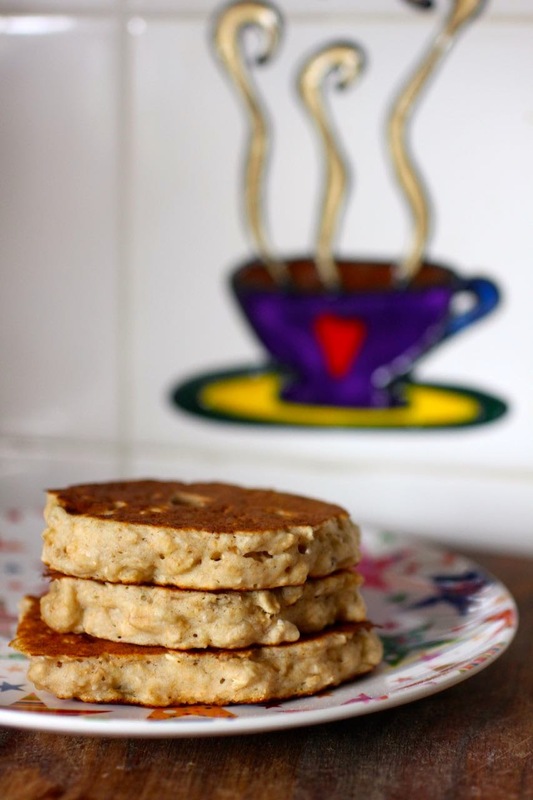 I actually first blogged these banana oat hotcakes back in 2011 when Sylvia was 2 years old so she has grown up with them. (We always call them pancakes not hotcakes!) 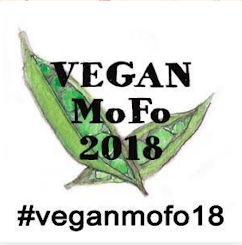 Last year I started to making a vegan version that I am sharing today. I was inspired to try veganising the recipe again after Vegan MoFo last year. 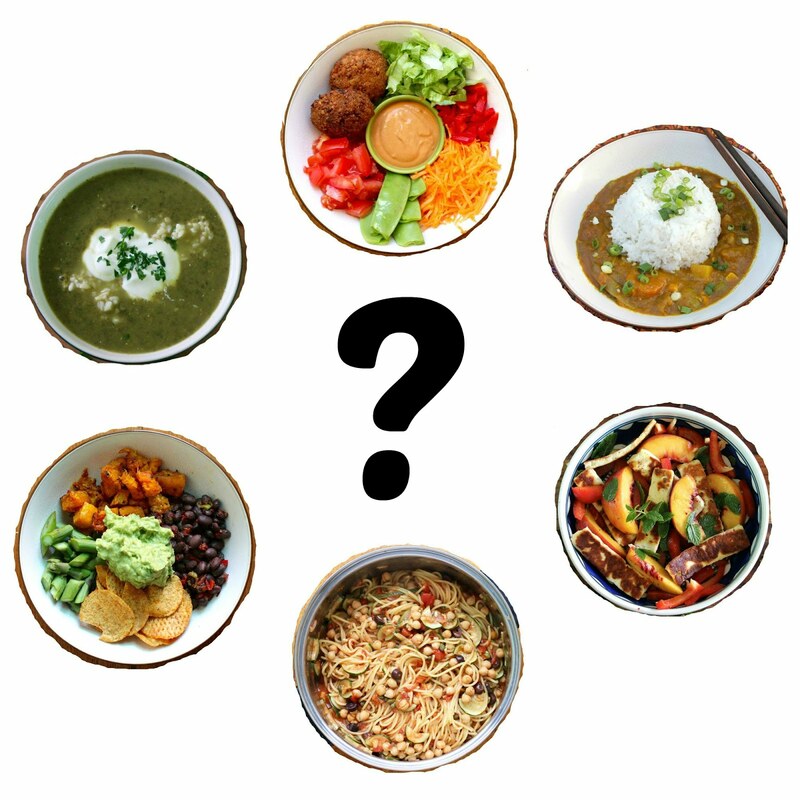 This challenge to blog vegan food for a month has helped me learn more about veganising foods. I made so much vegan food we didn't have eggs in the fridge for weeks. 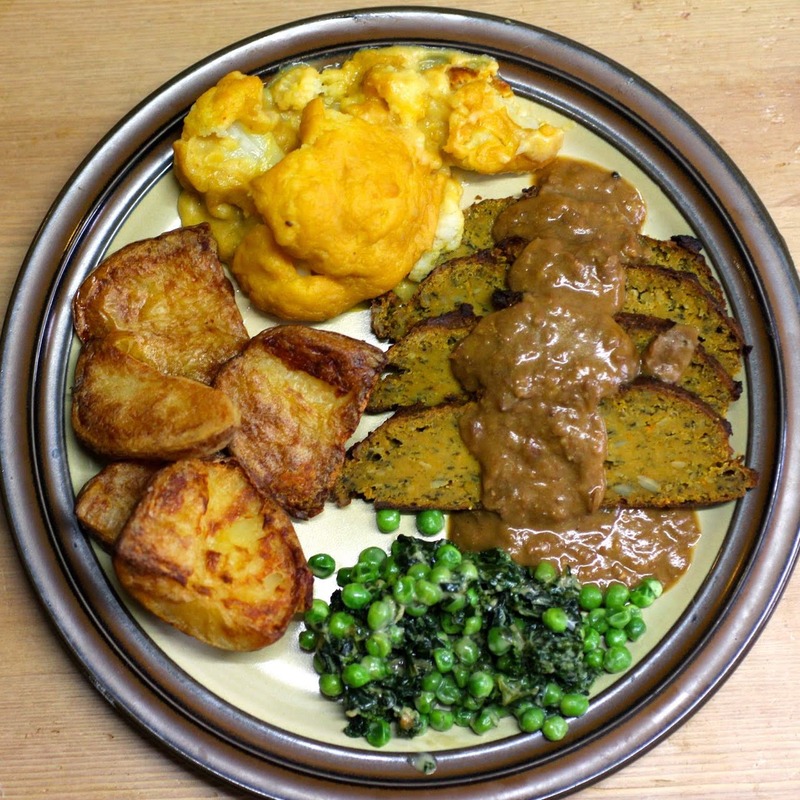 It was a challenge to veganise this recipe. I tried one vegan version in 2012. 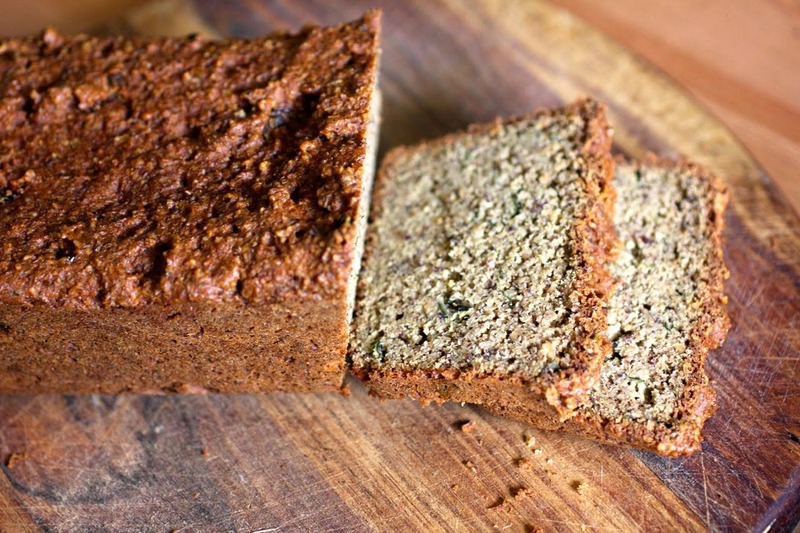 It was too soggy with bananas and flax. Isa's vegan pancakes made me think I needed more starch. 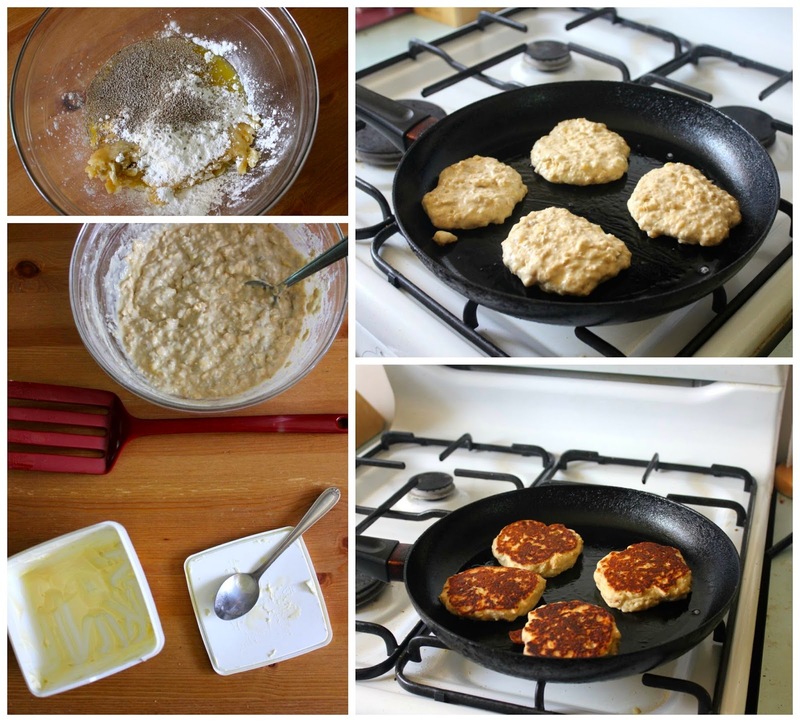 I turned to a recipe for home made egg replacer. However I am not vegan and if we have eggs I sometimes make these pancakes with eggs. So I think it is useful to note that I can barely tell the difference. The vegan ones are just slightly more fragile but still taste excellent and I am really happy with the fluffy texture. 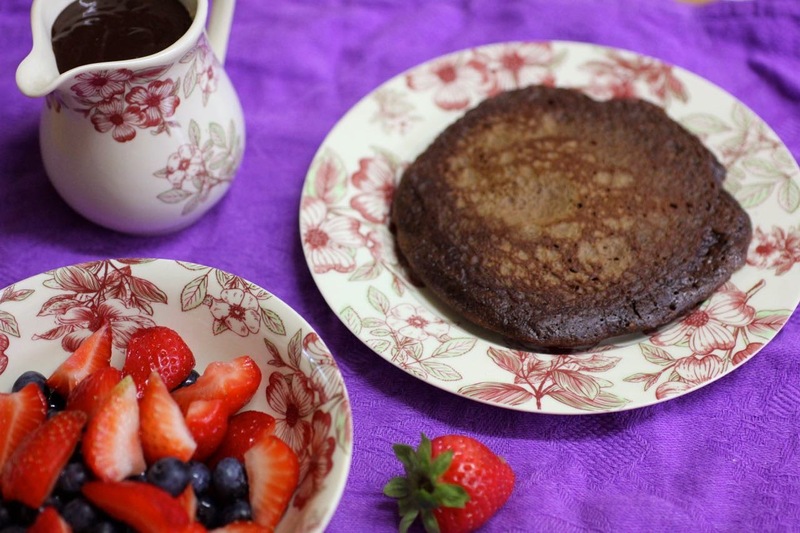 It is interesting that the photos of the vegan ones are actually more pillowy than the eggy ones. We often make these pancakes on weekends. 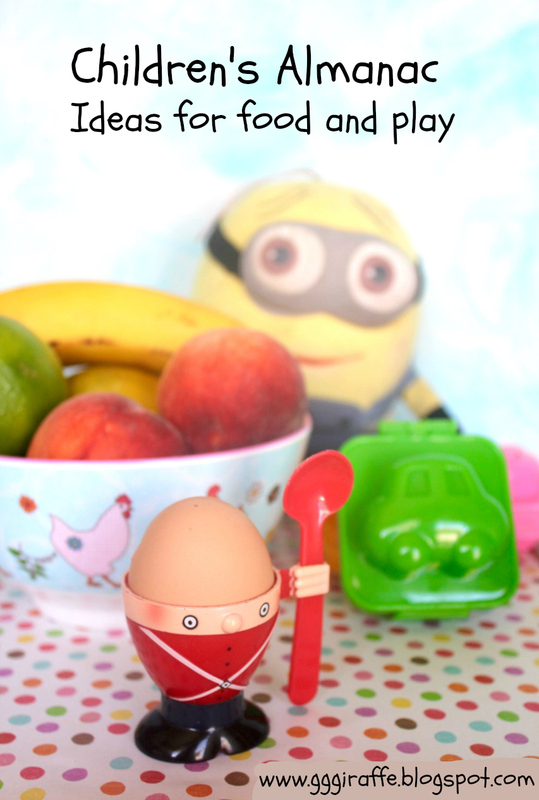 Sylvia loves them as a treat and it is a great way to use a manky banana. In fact now Sylvia loves it when there are blackening bananas because it means pancakes. She loves to help make the pancakes and my cunning plan is that she will soon rise on a weekend morning to serve me pancakes in bed. We had these pancakes on the weekend. Drowned in maple syrup. The lemons are ripening on the tree so we might be having more pancakes with lemon and sugar soon. When Sylvia had a few sleepovers on the school holidays these were mandatory for breakfast. However we did find that her cousin would not eat them because they had banana. They are not for everyone. But I can see us eating many more of these in the future. 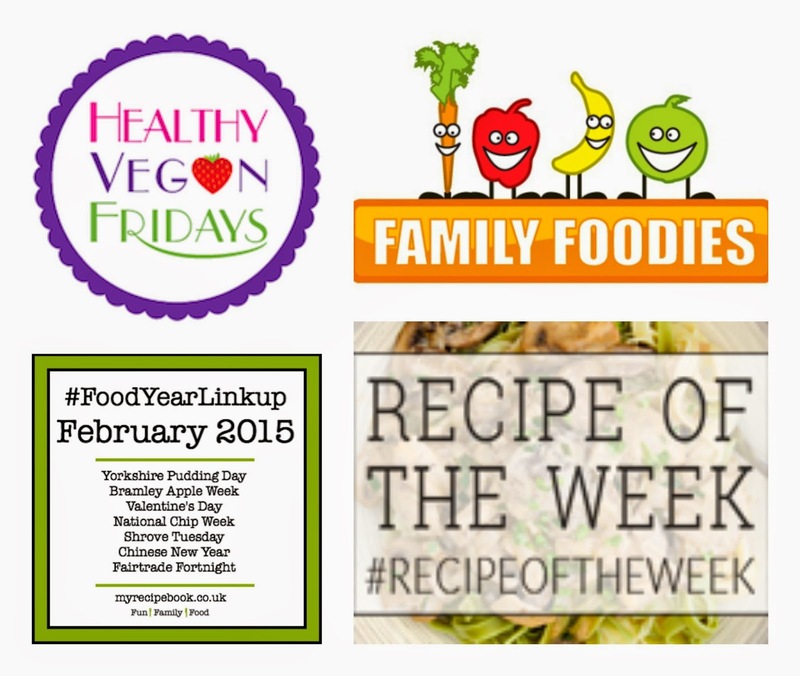 Bangers and; Mash and Eat Your Veg for February's Healthy Family Foodies blog event with the theme of Pancake Party. Kimmy of Rock My Vegan Socks for Healthy Vegan Fridays #34. 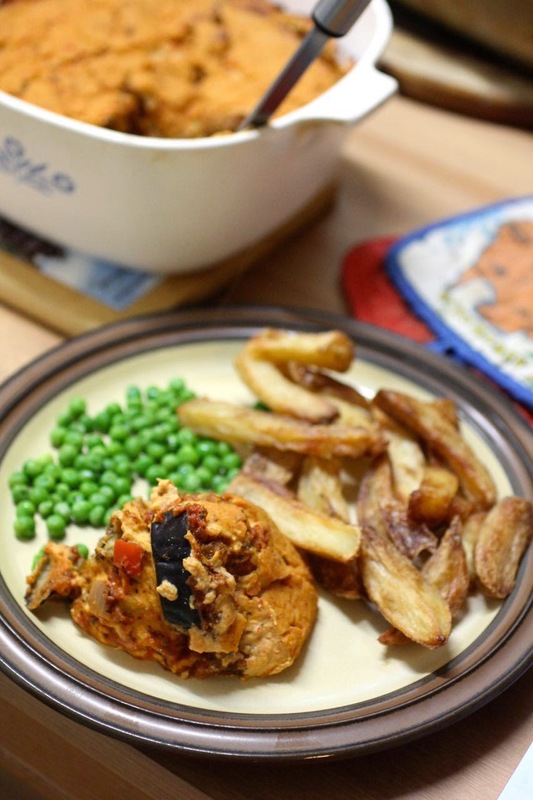 A Mummy Too for Recipe of the Week for 14-20 February. My Recipe Book for February's #FoodYearLinkUp. Melt margarine and golden syrup together (we do this in the microwave). Stir in mashed banana, potato starch, tapioca and chia seeds. Stir in 3/4 cup of milk. 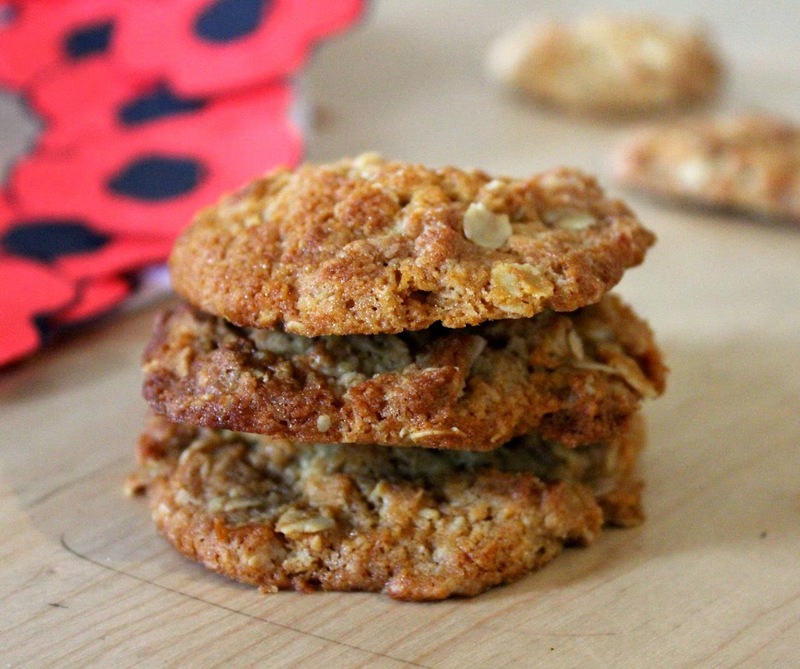 Mix in oats, flours and baking powder. Add a little milk to loosen it if required. The mixture should be quite thick but I like to add an extra 2 tbsp of milk. Heat a heavy bottomed non stick frypan over medium high heat. When warm, reduce heat to medium. Take about 1/2 to 1 tsp of margarine and swirl over the pan (I usually use the spoon to swirl it around the pan). Drop heaped dessertspoons of mixture onto the frypan with about an inch between them if possible. Fry for a minute or so until a few small bubbles appear. Flip over (bottom should be golden brown) and then fry about another minute until golden brown on the underside. Eat warm. We liked to serve ours with maple syrup or lemon and sugar or stewed fruit and yoghurt. 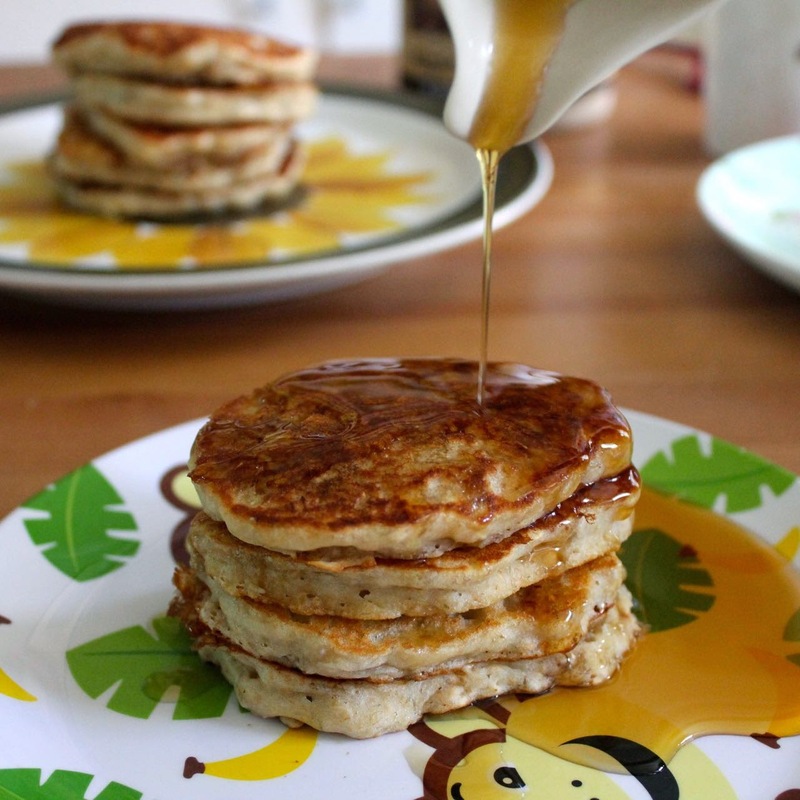 The pancakes can also be eaten later in the day at room temperature or frozen to eat later. 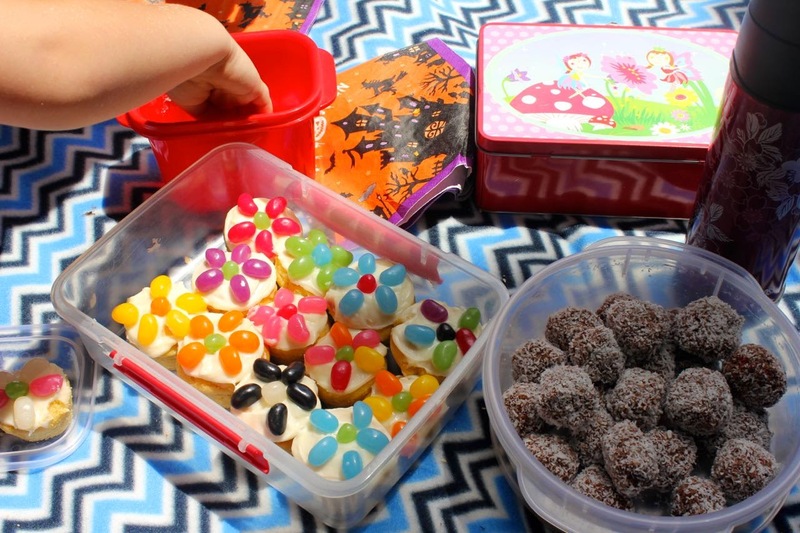 Who would have thought that a packet of jelly beans would run out of matching colours before we finished decorating the cupcakes for my birthday. It didn't matter. 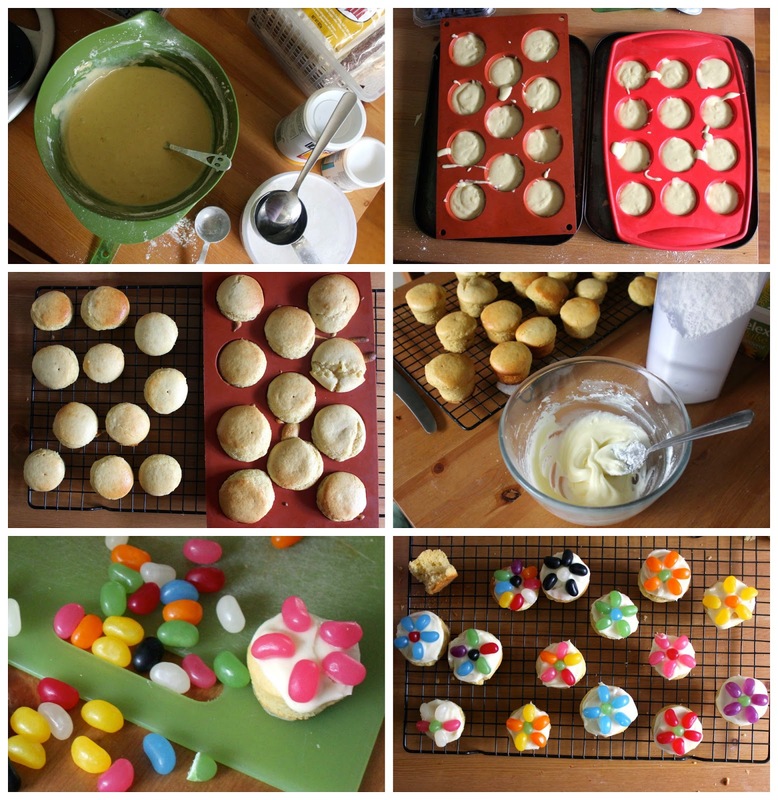 The cupcakes looked colourful, tasted good and were fun to make with Sylvia. We took them on a picnic lunch at the zoo. 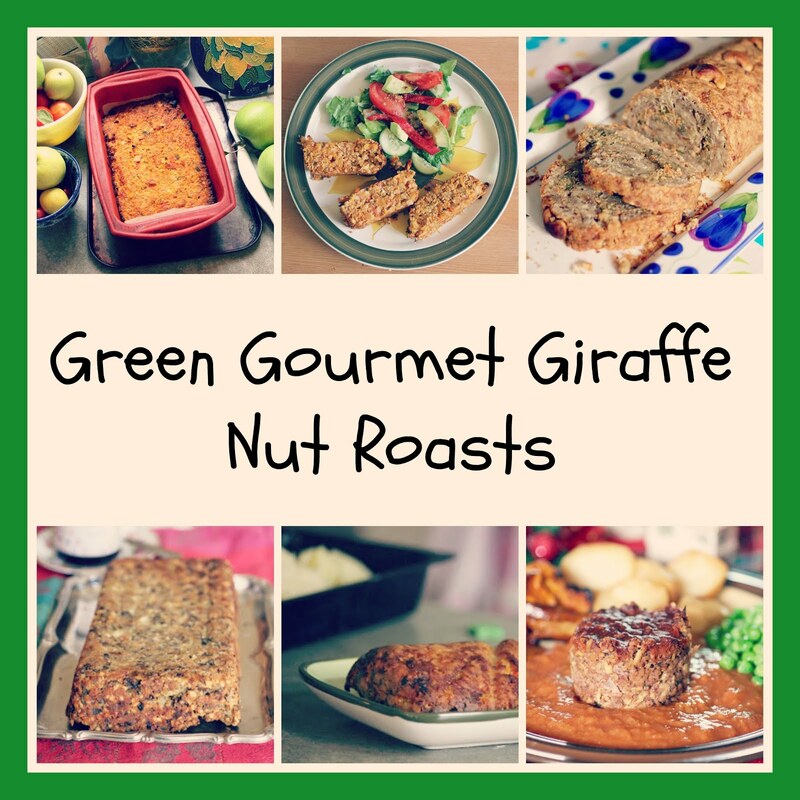 The lions roared, the giraffes were elegant and the food was good. The weather was even gentle and mild. And I took heaps of photos! Lately there have been lots of different versions of Tim Tams and I used mostly caramel Tim Tams but also a few red velvet Tim Tams. The caramel didn't blend up too well which meant there were some gooey pockets in the grubs. Caramel aside, the Tim Tams didn't make a huge impact on the taste. I am glad I tried it. I am not sure it will replace my usual use of Marie biscuits in the grubs. 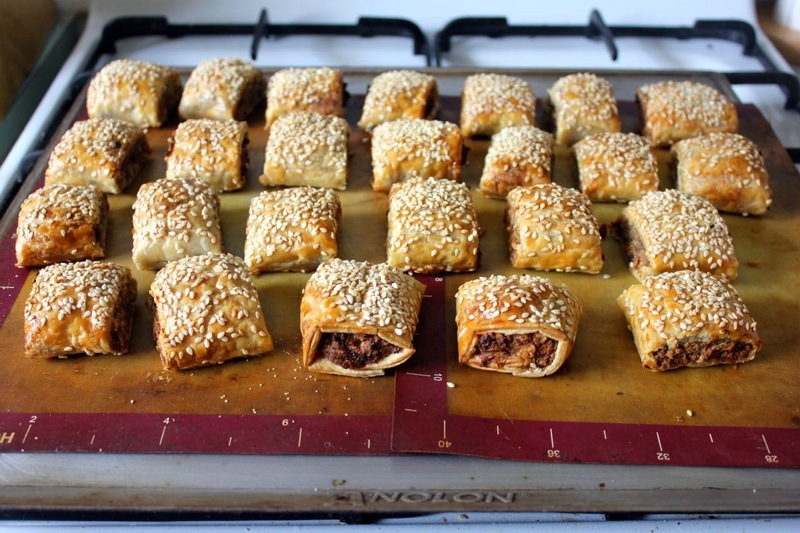 I can make the sausage rolls and grubs without too much effort because they appear so regularly in my kitchen. Making gluten free vanilla cupcakes is still a challenge. I decided to use some Bob Mills gluten free flour mix. Sadly the pantry moths had made a meal of it and ignored the White Wings GF mix that I don't like so much. Fortunately I have tried a few GF flour mixes and was able to make my own. It worked quite well. The resulting cupcakes were quite dense in the way of a British Victoria sponge rather than light and fluffy like an Australian sponge. I was happy with that. The recipe I followed didn't call for xanthum gum but I had it so I used it. I am curious about how and if the cupcakes texture would change without it. We made the cupcakes in the morning before heading off to the zoo. Gluten free baking is best had fresh so I didn't want to risk it being dry. I made the icing with a large dessertspoonful of cream cheese, a teaspoonful of margarine and enough icing sugar to make a spreadable icing. 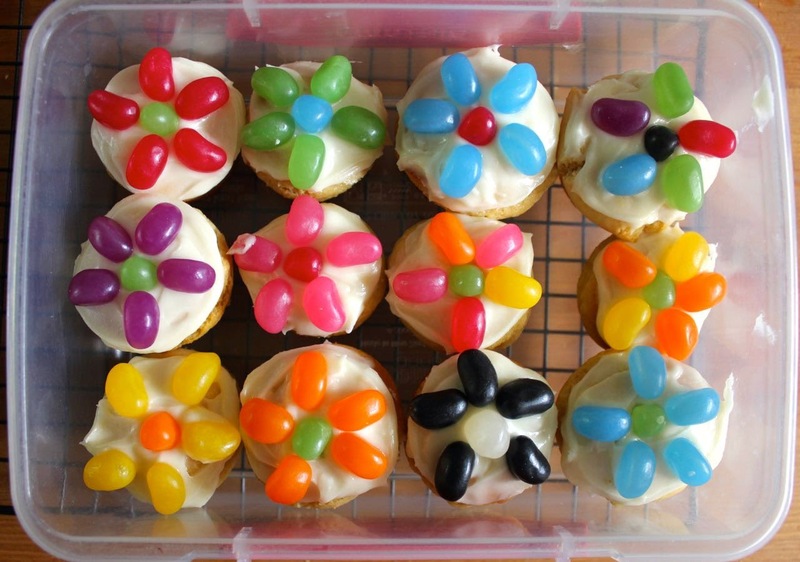 I underestimated and found myself running short of icing and jelly beans. 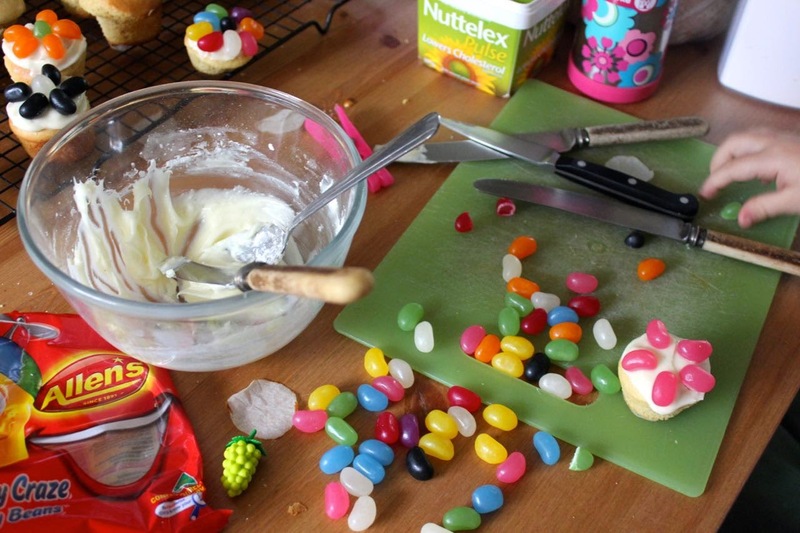 Sylvia and I had fun doing jelly bean cupcakes. 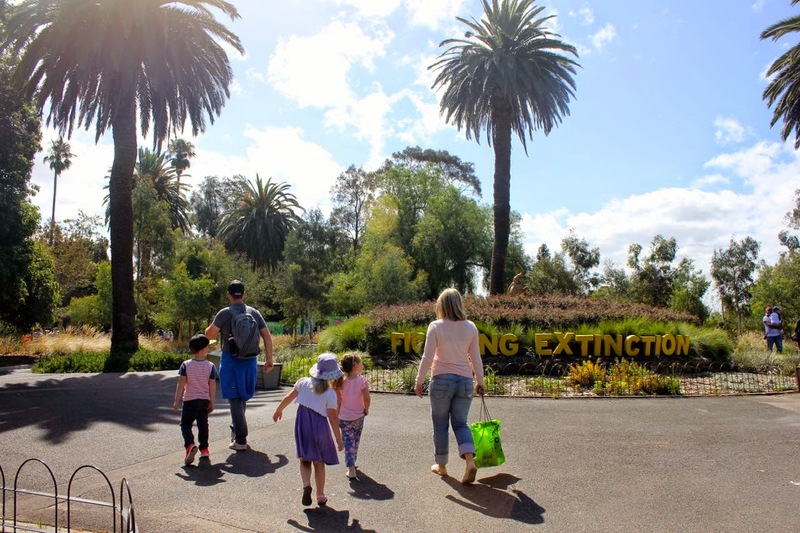 It was a bit of a rush but even so we were the first to arrive at the zoo. I guess that is joy of going somewhere near home. The rest of my family were travelling there from Geelong. The animals at the top of our list to see were the lions. 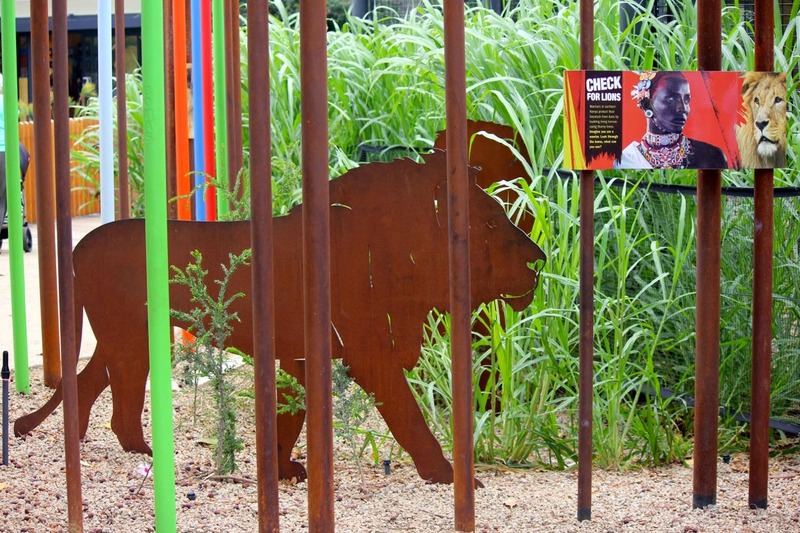 Last time I was at the zoo, the lion enclosure was closed while they built a new one. 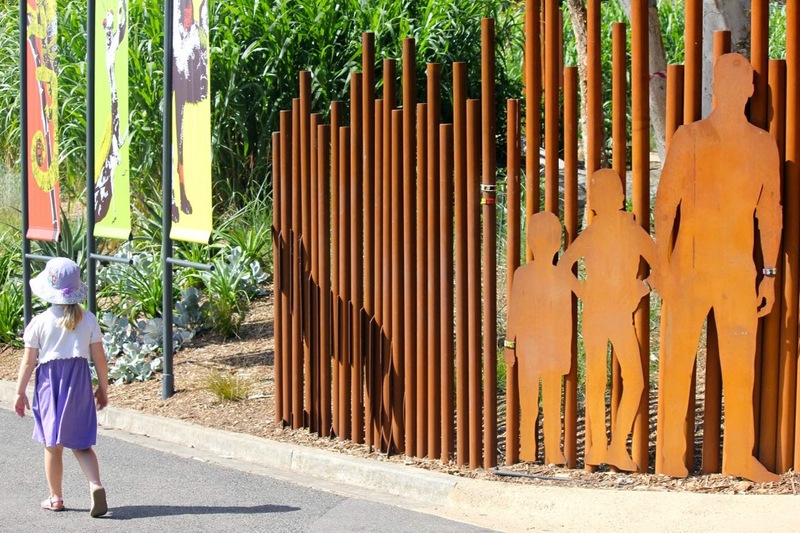 I was a little sad that the walkover has gone because it is one of the parts of the zoo that I remember being there when I was a child. 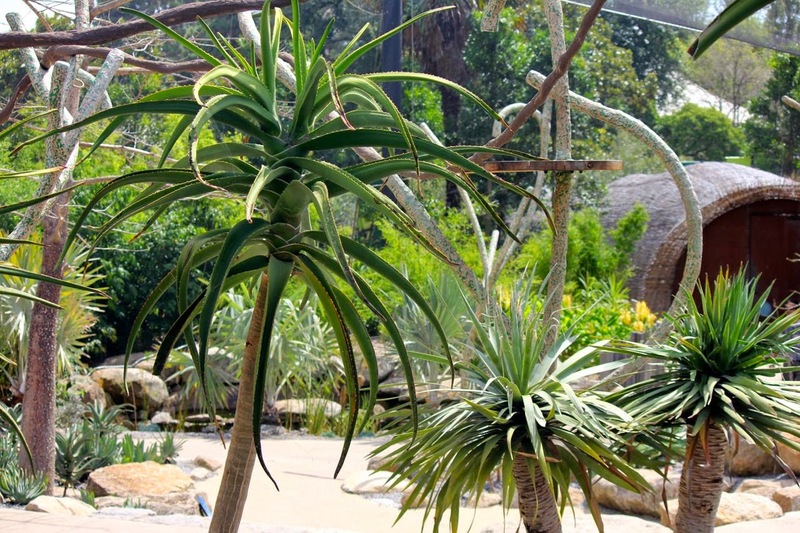 The new enclosure is impressive and modern and gave much better views of the lions. There is a lot more information and buttons to push to hear lion noises. I still miss the old enclosure. After the lions, we hung about the meerkats and the tortoise and caught up with more of the family before seeing the seals. Below is just some of my family - siblings, nieces, nephews, in-laws and parents. 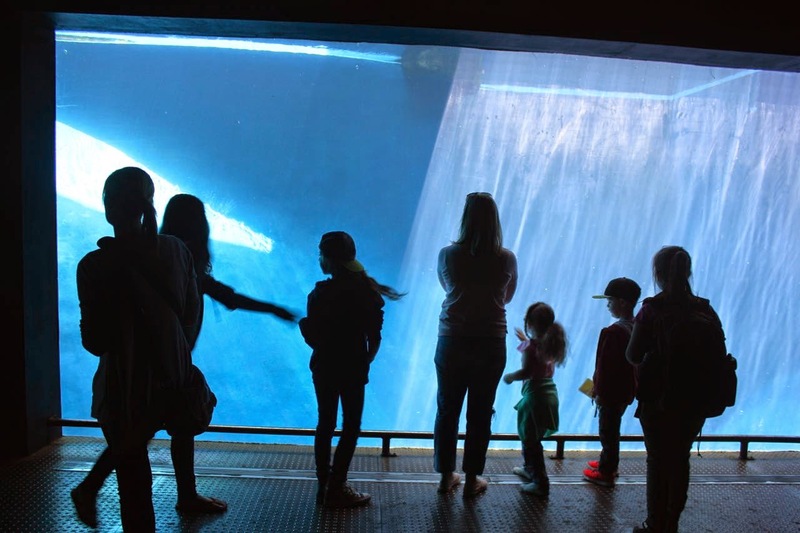 The seal enclosure is so calming. And the little fairy penguins were also swimming about near the seals. We spread out some rugs at a grassy area where we stopped eat out picnic. The sausage rolls made me very happy and were welcomed by quite a few of my family. We also had dips, chips, vegies and rye wraps. By the time we got out dessert everyone was quite full. I really liked the cupcakes and they seemed to go down well. My mum had made a chocolate cake and, though there were no candles, everyone sang happy birthday and I cut the cake. We walked through the elephant trail, which includes tigers, butterflies and orangutangs. It is a trail that we know well and always enjoy. The mother and baby elephant were playing with each other, the butterflies landed on everyone and the tigers were out but I couldn't see a thing for the crowds. The 'zoopermarket' in the orangutang area was interesting. 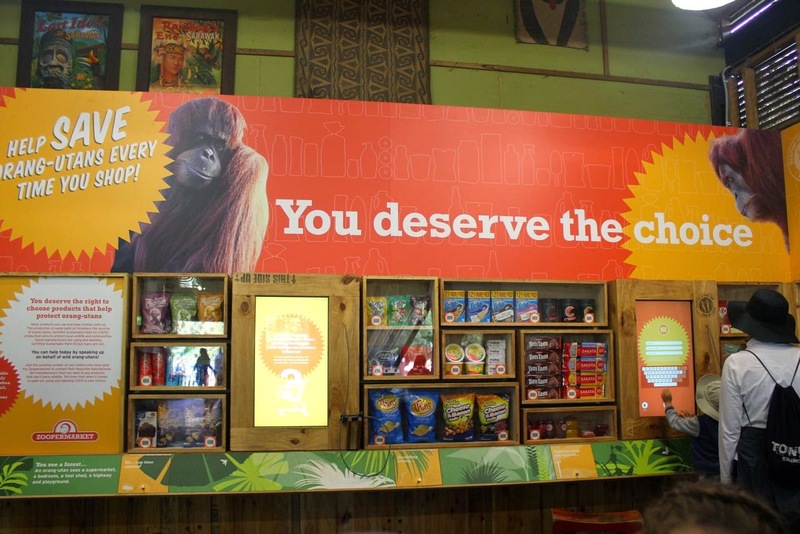 The kids loved the cash register and the modern scanners that actually scanned where products had palm oil in them. I did the gorilla and monkey trail for the first time since work has been done on it. The first animal on this walk is the lemurs. I really loved all the curly poles and trees that looked a little Dr Suess. 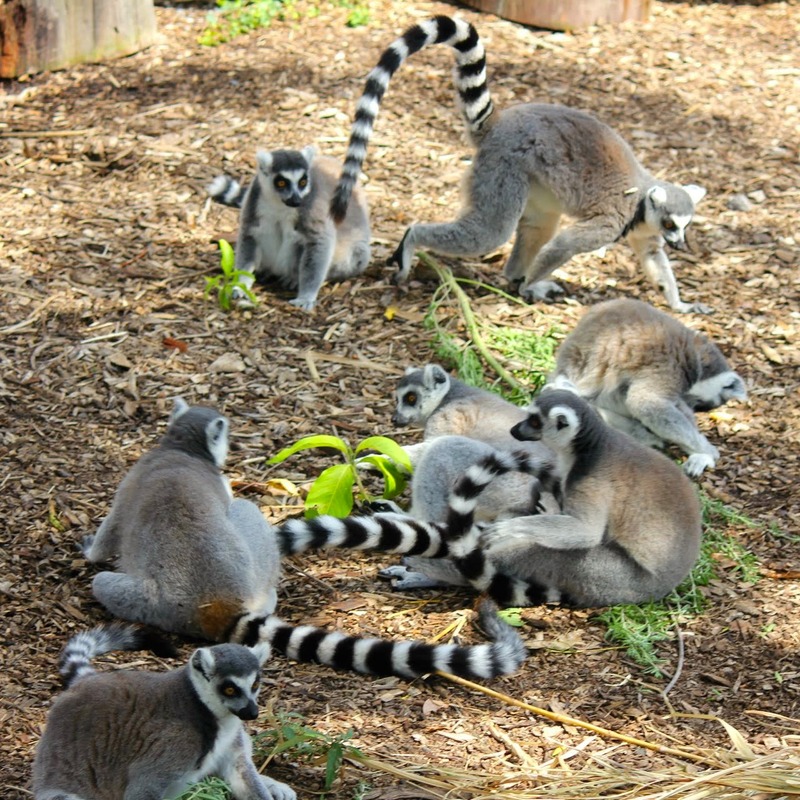 And the lemurs were great fun to watch. 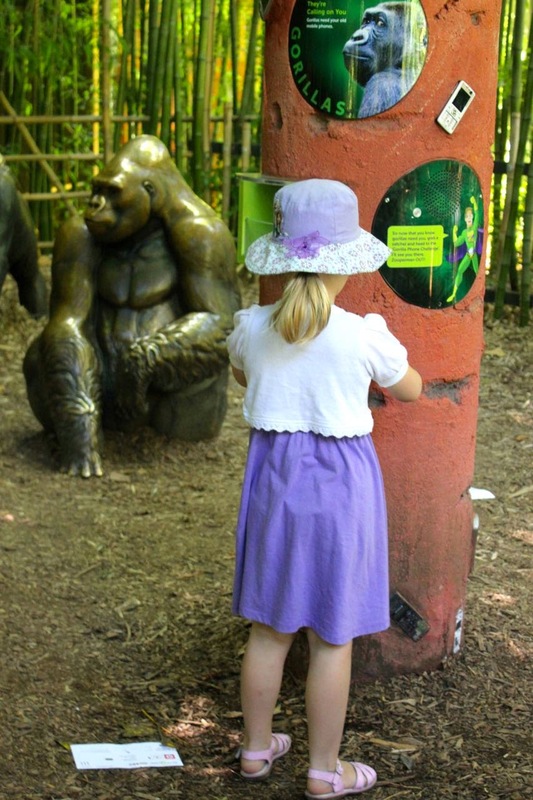 Sylvia and her cousins were fascinated by the exhibits about recycling mobile phones to help the gorillas. These poles below have old mobile phones in them and buttons that make noises like old mobile phones. They brought back memories. I enjoyed seeing all the monkeys as we walked along the trail. The latecomers had gone to check out the lions. Meanwhile E was off looking at the wombats. And Sylvia was playing hide and seek with her cousin along the walkway. Soon it was time to go home. We had walked about as far as we could. While no one had much room for the grubs straight after lunch, I didn't have so many to take home. I offered them around after we walked through the butterfly house. My brothers, always a bit suspicious of my cooking, asked if they really had Tim Tams in them. When I confirmed it, their eyes lit up as they sampled them. 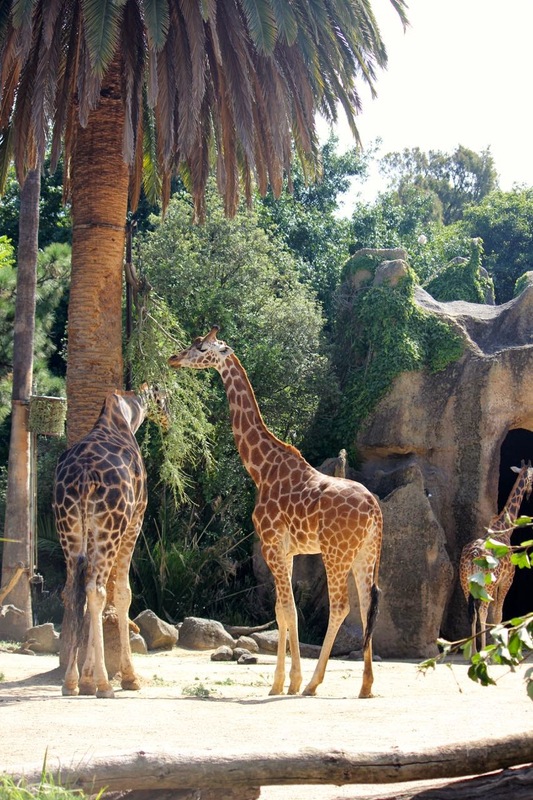 But I had to just stop in and see the giraffes before we went. Such magnificent creatures. Then it was time for our train home for some leftover sausage rolls for dinner. 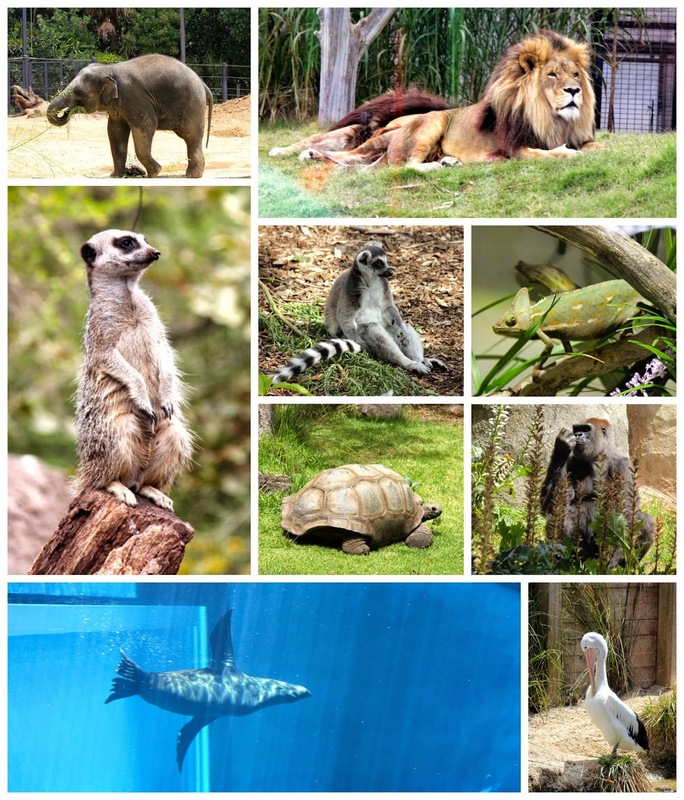 I am hoping we might get to the zoo a bit more often this year as I have now signed up to a zoo membership. When I asked Sylvia what animal she would like to see, she said a dolphin. Um... there are no dolphins at our zoo. Oh well, there are always the meerkats! I am sending this slice to Caroline (and Ros) for Alphabakes, the challenge to bake with ingredients or dishes starting with different letters of the alphabet each month. This month the letter is V - which here is V for Vanilla. Put the Tim Tams in the blender and process until the biscuits are pulverised to crumbs. Mix Tim Tam crumbs with coconut, cocoa and condensed milk. 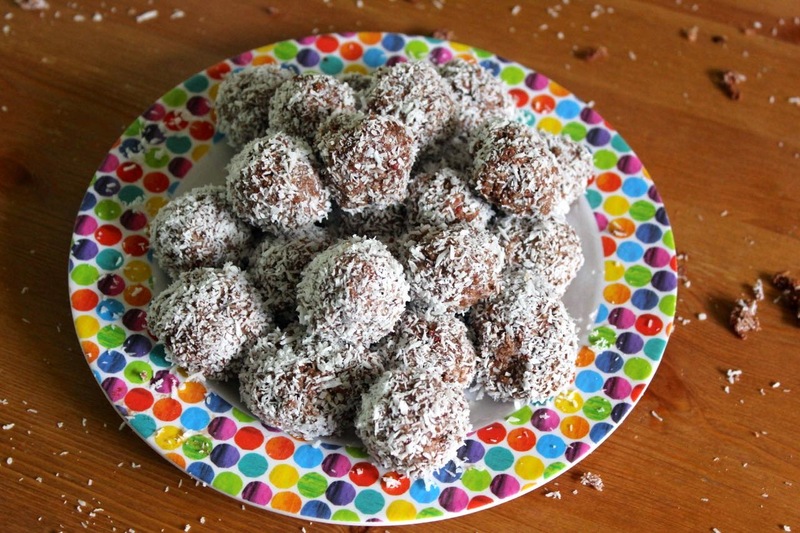 Roll into balls the size of a walnut and toss in coconut to coat. Cream butter and sugar. Beat in eggs and vanilla. (I used a spoon up to this point but you could use electric beaters here.) Stir in flours, gum and salt and milk to make a thin batter. Spoon into 2 x 12 hole mini muffin pans. Bake at 180 C for 10 to 12 minutes or until golden brown and a skewer comes out clean. NOTES: I used a leftover 1/4 cup and 2 tbsp of condensed milk, so instead of the 3/4 cup caster sugar I used 1/4 cup, and instead of 1/2 cup milk I used 2 tbsp. I used soy milk which is our household milk of choice. I also used Nuttalex margarine instead of butter.